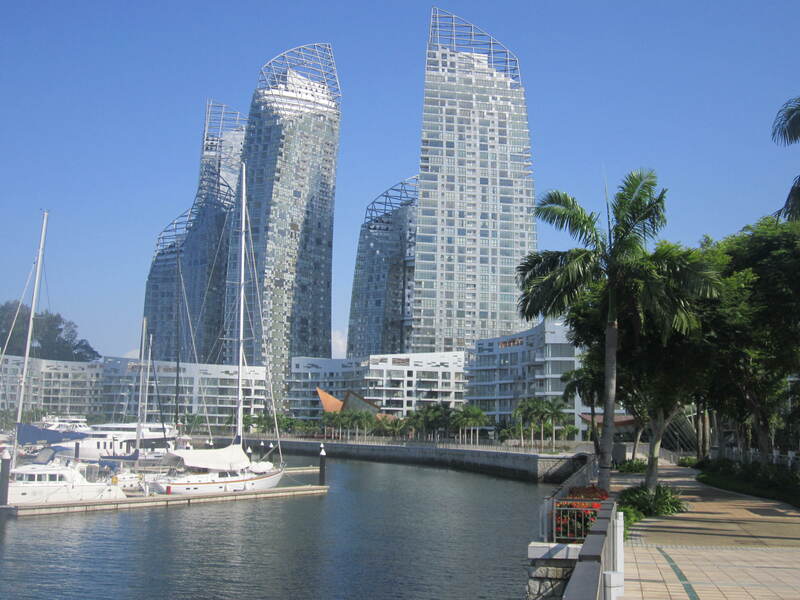 I got to bed at 2 a.m. and was up at 6.45 a.m………Breakfast was included so I sat out on the deck admiring the view back to Singapore while I stuffed myself having lots of fruit and an omelette. I thought I was going to have to walk the 4 km back to the port………..luckily there was a free shuttle bus which I took instead. Bang on 9 a.m. I collected my bike and headed for the jetty. There was a 0.60 cents tax to leave the island. It was a bit of a free for all waiting for the big speedboat. 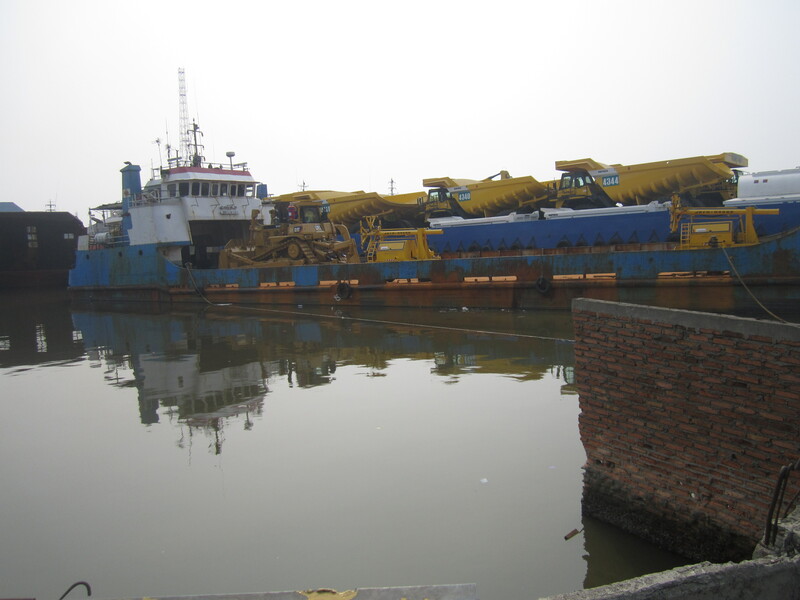 When it arrived all the cargo was lifted from the wharf up onto the roof of the speedboat. I thought this could go terribly wrong as I watched a couple of guys struggle with my bike. The last thing I wanted to see was my bike in the sea. I was the only tourist on the boat. To be honest I don’t think they get any tourists at all. It was a long but very picturesque boat ride. We started off by going through hundreds of little islands. Some of the islands had little villages. Everything was very green. There were lots of small boats moving around. We then had a stretch in the open sea. 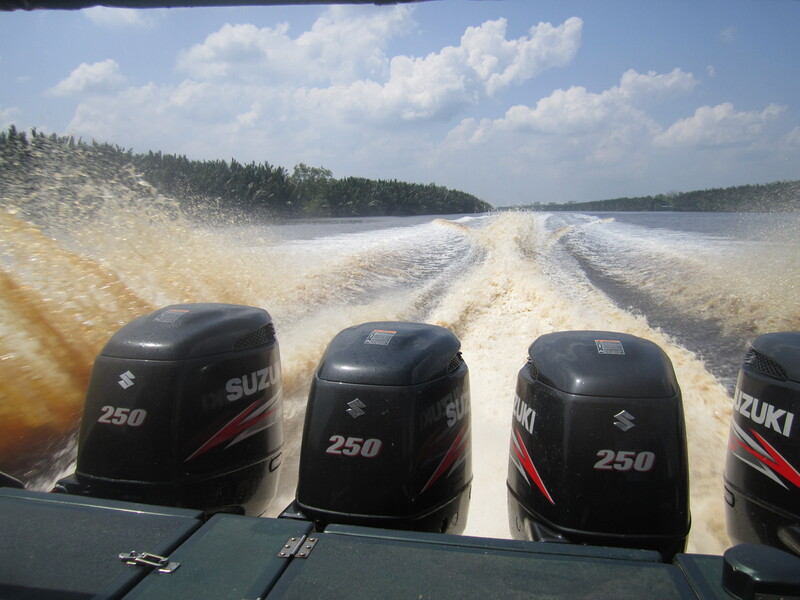 The boat travels at over 60km/h. It became a bit bumpy. Sometimes we would be flying through the air and then just drop. I don’t know what happened but the boat stalled and we were left rocking violently from side to side. Everyone was left a little shaken including myself. I think he was going to fast and misjudged a wave. It was better when we were closer to islands because the sea was flat and I felt a lot safer. The boat itself is brand new. The life jackets still in the plastic wrappers. The ocean is a great place to put all your rubbish, because it will just disappear – so the Indonesians think. There was a lot of floating rubbish and along the banks were toilets on stilts over the water and everything was just going in the water. You certainly wouldn’t want to swim. One nice thing to see was lots of flying fish. We reached Kualatrongkal around 5 p.m. It was a struggle again to get my bike off and a few nervous moments. It was a fairly large town with lots and lots of old wooden buildings, lots of rubbish and lots of people…………very friendly……………..everyone says hello mister. I tried finding a hotel………..too late in the day to start cycling. They were too dirty…….or too dirty and too expensive. I then had two local girls help me find a hotel. It was okay very basic and cheap at just $3 for a room. I was starving and I then took the girls for dinner. The grand total for 3 of us was $4.20…………..I must eat with the locals more often. As soon as it got dark there were one or two power cuts every hour. The first was when I was in the shower. I only washed chest down because the water was brown. Shame I was on a boat because at some point this afternoon I crossed the Equator. I am now officially back in the Southern Hemisphere after 7 years. I went to bed early but I had a terrible sleep. I didn’t just get called to pray. I got the whole service. It went on forever and because. There would be a power cut and soon as the power was back on they would start again. This went on for hours. then a laugh. I don’t think they quite knew what to make of their new visitor. When I awoke after an hour there were about 20 kids around me………………..I said OK who speaks English…….and received a roar of laughter. One kid replied ‘ no I don’t speak English’ to another roar of laughter. After my break I pushed on slowly with still more hills it was a struggle. 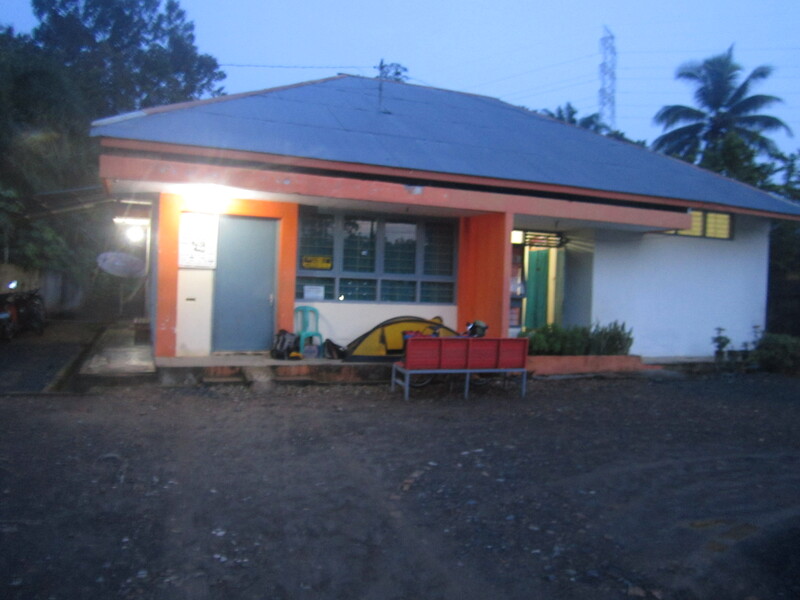 An hour later and 10 km further down the road I saw the sign for Jambi……….70 km away. I was planning to make it in one day. I was only half-way so that wasn’t going to happen. It was a small town with a petrol station and at the back of the petrol station was some green grass. So I went straight in and asked to camp. Spoke to the owner and no problem. Later on a small kid sent by his mother brought me over some fruit. I noticed a lot of 4x4s on the road that had a symbol I had seen earlier on my travels. The symbol was confirmed when one stopped and asked me not to take photos of a derrick in the middle of nowhere. The symbol was for petro China. The Chinese are here too. I thought there was oil around when I first started to see the pipelines crossing the road. 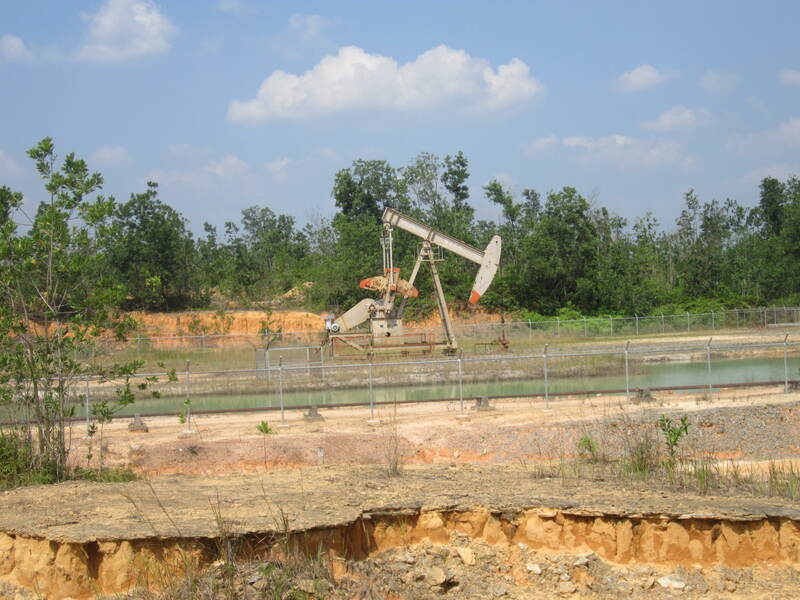 A sight better than the pipeline was a troop of orangutans playing in the trees next to the road. But I didn’t get a good look because they bolted as soon as I passed them. I was up at 6 a.m. and gone by 6:30 a.m. in an attempt to beat the heat. It started well. It was a beautiful morning. Perfect for cycling………..nice and cool. I could hear the monkeys squawking and the birds singing. 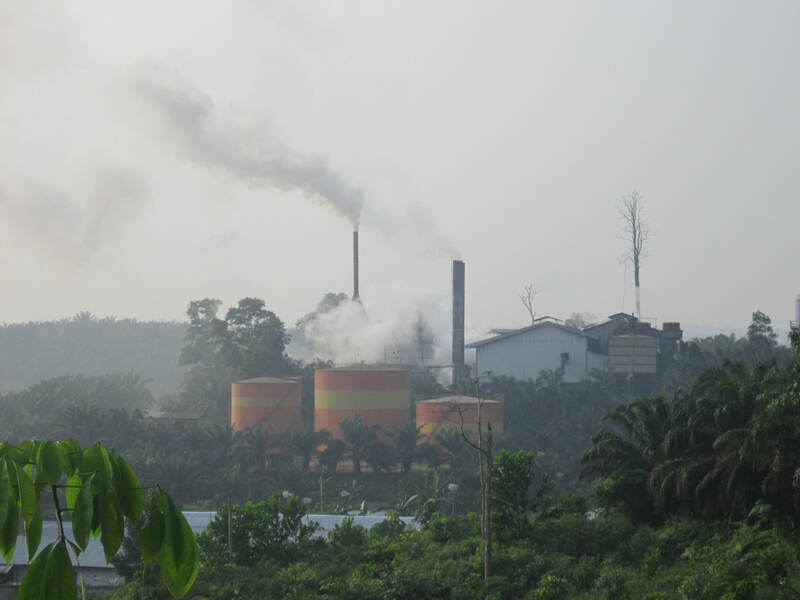 The beauty was somewhat spoilt when I came across a palm oil factory billowing out pollution. I cycled 16 km before stopping for breakfast,consisting of chicken and rice. My nickname for Indonesia is now Hilly Indonesia because it was again up and down, up and down. The ups are steep. No gradual climb. Again I had to stop many times for a cold drink. Once the sun is up, it is difficult to cycle. After 30 kms I came down to a main river. This was a good sign because it meant I had a good flat run into Jambi. On the outskirts I came across a museum. It had a flying boat out the front so I stopped to visit. It was totally in Indonesian. But looking through it I got a basic history lesson for the last 100 years and some other important information. Looking through some photos I saw a picture of some guys catching a crocodile. Putting two and two together my thoughts were confirmed when the museum guy said there were still crocs in the river. That’s certainly given me something to think about when I am camping. Finding a hotel was difficult. Some didn’t want me and some were too expensive. In the end I had to settle for a basic $10 room. 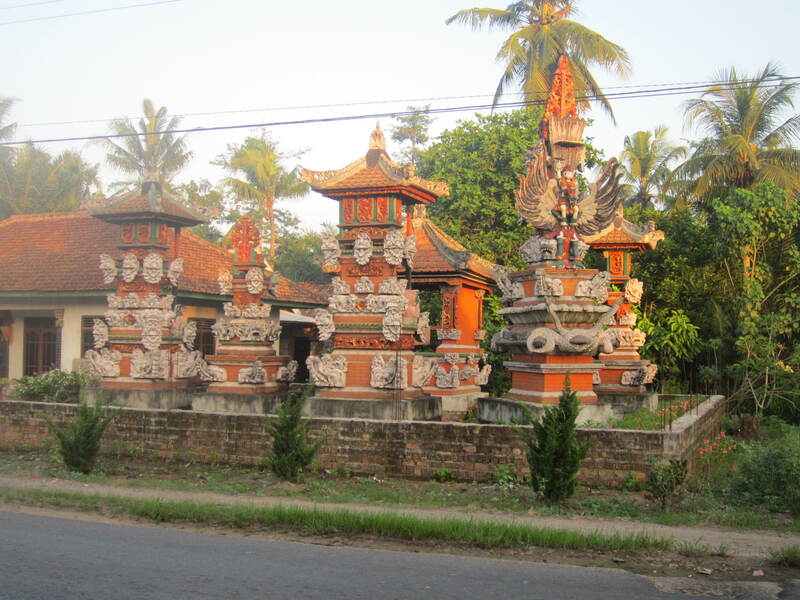 7 a.m. on a Monday morning Jambi was very much alive as I cycled out past the many old wooden houses on stilts from the Dutch period. The other good thing about the Dutch is that the Indonesians use letters which makes things easier. I cycled 30 km before stopping for breakfast at a small roadside restaurant. I had an omlette, rice and a bowl of chicken noodle soup. I was joined by a local guy who worked in the bank and kindly paid for my breakfast. Before leaving it was out front for half a dozen photos with the guy from the bank, and then the lady from the restaurant and her daughter wanted to get in on the act. At 10.30 a.m. and after 50 km I stopped for a cold drink and a lie down. My lie down was interrupted by half a dozen 15-year old girls who all wanted me to get up for a photo. Then more locals arrived and it was photos with parents and their babies. Photo taking is starting to take up a big part of my day. But I do enjoy it and it is never a problem. 70 km and just 1 hour later I stopped for lunch. After breakfast it was a bit of a dud……….dry plain boiled rice and some green vegetables. In the restaurant the guy had a pretty old looking stuffed Red Panda which I got him to pose with. At 90 km I stopped again for a cold drink and then slept for 1 hour. The afternoon sun is a real killer. Every day I start to overheat. I have to take these long breaks just to get the body temperature back to normal. I only cycled another 12 km and I was ready to stop again for a cold drink. I had an iced tea and 6 small deep-fried batter noodle and chicken filled balls I went to pay………again too late someone had kindly beaten me to it. I had been eyeing up somewhere to camp. The house next to the shop had a nice porch. I asked and it wasn’t a problem. They suggested the patch of dirt in front of the porch. So I quickly put my tent up. They then suggested I put it on the porch which I preferred because it was clean and under cover. The family are a Christian family, 43 and 40 years old with a 15 year old daughter and a 3 year old boy. The mother of the father also lived with the family. They asked if I wanted to wash so I gathered my stuff and was led by the mother through the bush for about 400 meters to the village spring where I washed completely ‘starkers’ out in the open with a a rope and bucket. Very refreshing. The family spoke some English and fed me well. In the morning the family brought me oranges, a cup of tea and some cakes. I then cycled 34 km before stopping for breakfast. I had some very nice rice, beef and iced tea all for $1. 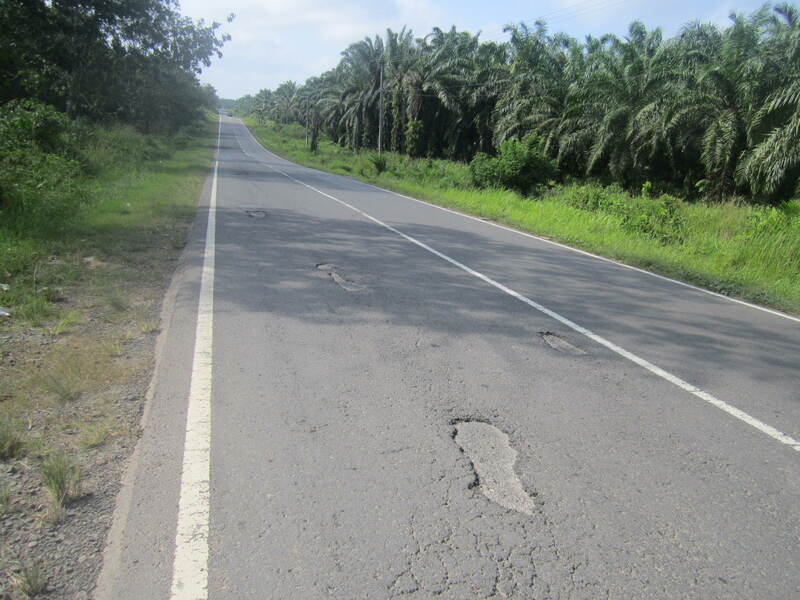 The road was up and down again passing through either very green palm, coconut or rubber plantations. 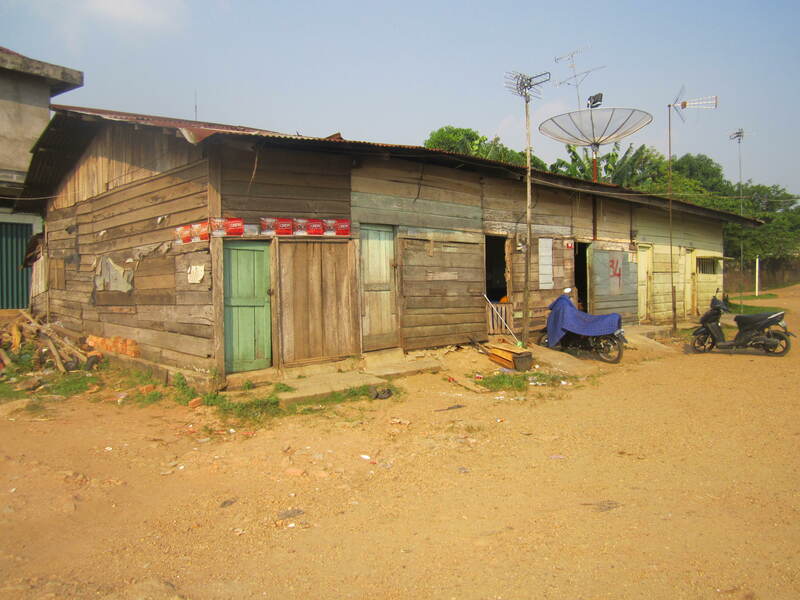 Along the road are many wooden houses on stilts. Most of these are a small shop of some kind. In the afternoon I got 3 punctures in the back tyre in one hit. I stopped to fix them and had a dozen children around to help. I didn’t do a good job because 10 km on the tyre was on its way down again. I couldn’t be bothered to fix it so I just kept pumping it up and cycling. I had to do this 3 or 4 times. After 103 km I got to a big town. It was only 3 p.m. in the afternoon but I was still ready to call it a day. Big service stations are always on the edge of town. The first petrol station was rubbish so I kept going. The one on the other side of town was also rubbish so I kept going. I saw a truck terminal so I had a look in there. There was some nice green grass but too many people around. A short way away was a transport police check-point. I said I was looking for somewhere to sleep. They directed me to a open hut on the side of the road with a bed. I wasn’t feeling well so I took it. At 5 p.m. I got to sleep, in my filth and someone else’s filth. I didn’t leave that bed for 13 hours. I didn’t sleep, only rested. It was so close to the road it was very noisy. I was eaten alive by mozzies. I got the call to pray and the roster crowing soon after. After resting for 13 hours I got up very dazed. Packed up. Pumped my tyre up. Said good bye to the transport police and was on my way. 8 km later I stopped for breakfast…………I was hungry because I had skipped dinner last night. I had rice and beef which was really tasty. I changed the inner tube and continued on my way. I am about 60 km from Palmbang and will stop here tonight. I am conscious to pace myself. I only have 60 days to cover the whole of Indonesia. Bali is about half-way and in excess of 2000 km, which is my normal good month. My plan is to only cycle a maximum of 100-110 km a day even if it is only 3 p.m. and I cycle on and do more. I also plan to have no days off. Instead of having some shorter days to enable me to rest, wash properly, shave and recharge batteries I reached Palembang and saw my first McDonalds in Indonesia. It’s quite a large modern city with lots of traffic about and tall buildings. 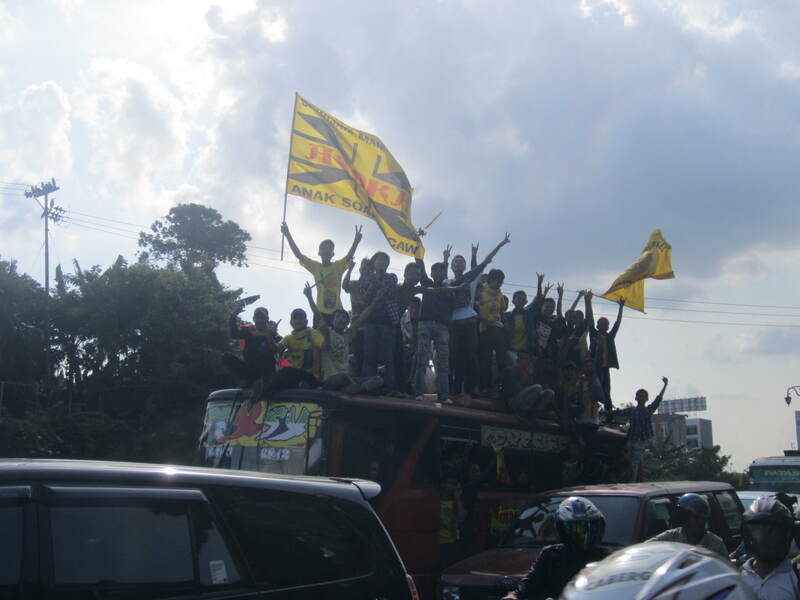 There was a football game on and loads of people were riding around on top of buses. Searching for a hotel was difficult as it is school holidays and many hotels were full. I ended up getting a reasonable hotel for $20 after a bit of persuading. 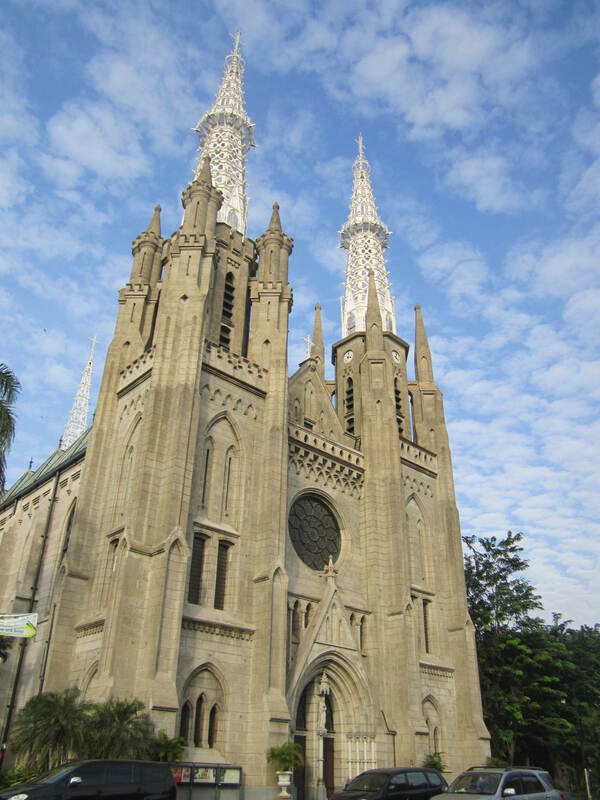 Across the road from the hotel are two large churches, one Catholic and the other Methodist. I met a lady in the foyer who was picking up her son from the Christian school. I asked her if she was Christian presuming she would say yes. But the answer was no Muslim. But she sends her son to a Christian school because they are the best schools. After sleeping the previous night in filth I was happy to have a nice hot shower and shave as well. I didn’t go far from the hotel for dinner. I found a nice small restaurant as usual they were very interested in me. I asked the lady if she had ever seen another tourist before and she said once about 15 years ago when she was 15. Everywhere I have been I have the impression there are none or very few tourists. The family in the restaurant were Chinese Catholics. The mother had a Dutch grandmother. They spoke good English. Their daughters went to the catholic high school. The father came down and we chatted for a while. 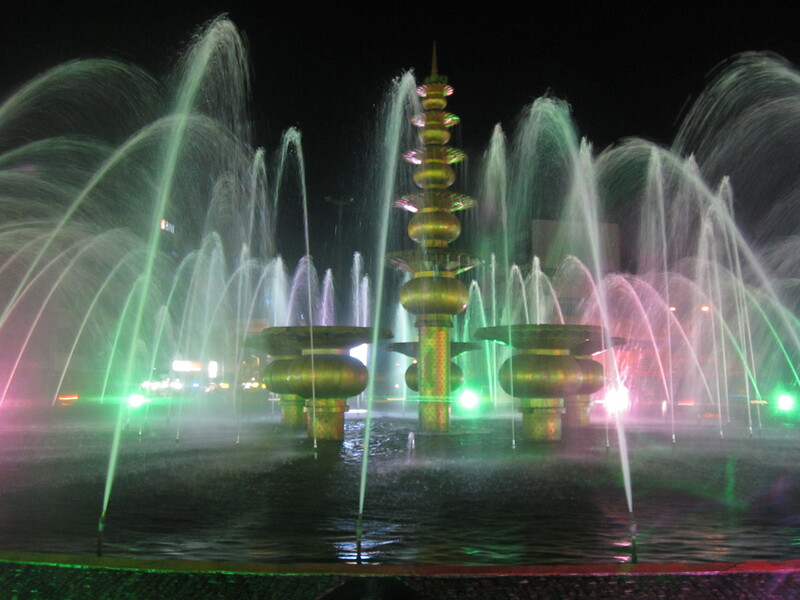 I think they were worried I wasn’t going to see anything of Palembang when I told them I was leaving tomorrow. So they offered to take me on a small tour. 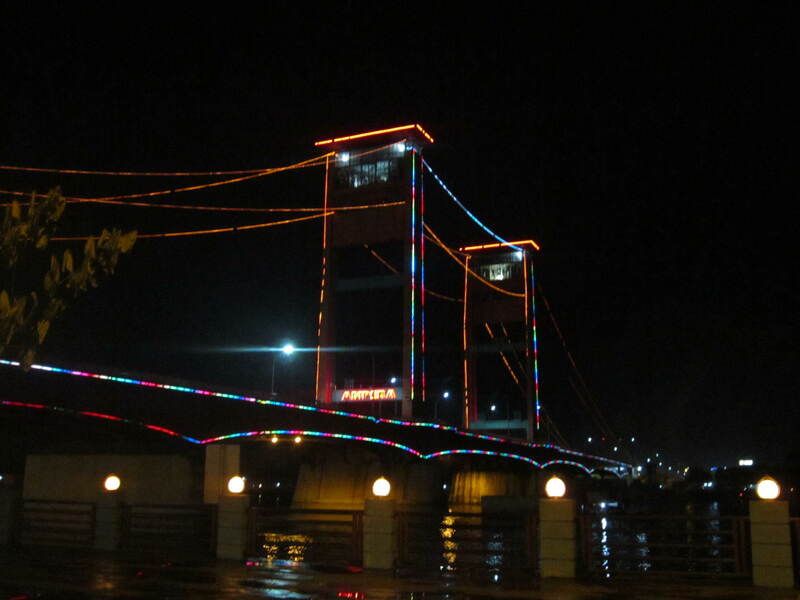 The most famous thing in Palembang is the large bridge that crosses the river. At night it is all lit up and looks very nice. We then walked along the river front where lots of family were out and about. Close to the river was an old Dutch fort now a military hospital. On our tour we also passed the grand mosque and a very large military monument. 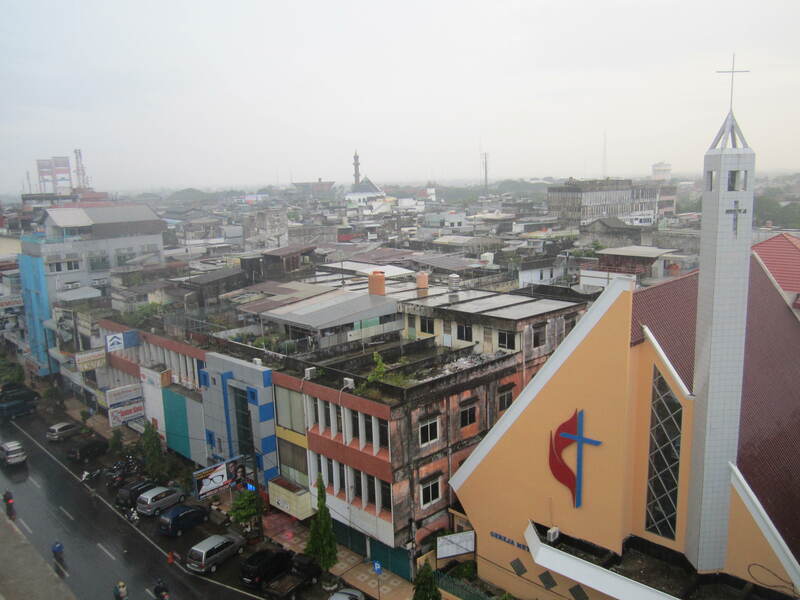 So thanks to the local family I did actually get to see something of Palembang. This morning at 10 a.m. I was still in the hotel. It was already hot outside and it was just too easy to go and pay for another night. It was sort of a constructive day. I started planning and researching the 10 or so ferries I will need later on not for the first time some of these proved difficult. Finding there was only one ferry every 11 days for one stretch just gave me an extra headache. ETA meant I would have to sit and wait 7 days which is just too long. So I need to find an alternative route. One rest day wasn’t clearly enough because I found myself repeating the same routine as yesterday. Sitting down and having the buffet breakfast and then booking back in to the hotel for another night. Solving my ferry problem was playing on my mind and I just wanted to solve it. Frustratingly I still don’t have a result. I went out in the afternoon heading down to the river. 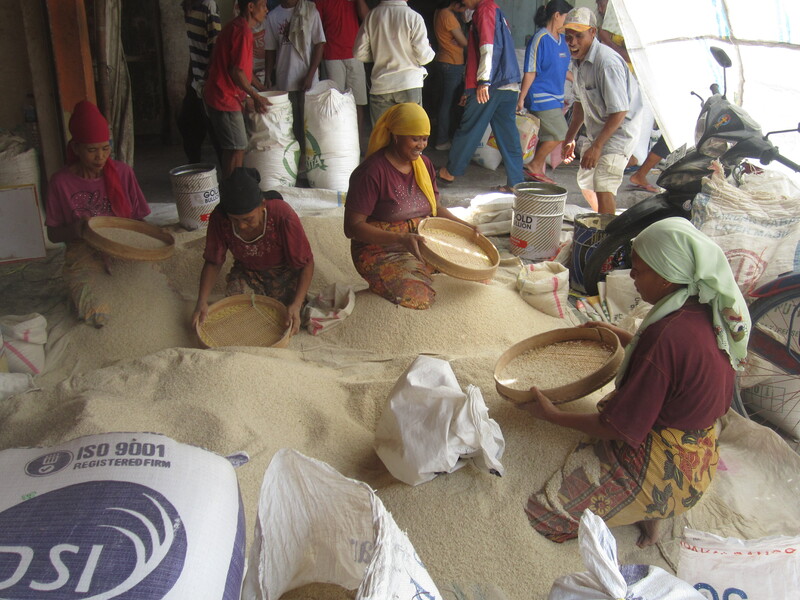 There was a small market and some local women were sieving the rice.Then walking up to the local museum……………..0.20 cents to get in. There was an array of traditional weapons, textiles, pottery and some other archeological finds. I wasn’t going to let the last two days repeat themselves. But it wasn’t until 9.30 a.m. that I finally left Palembang. I went straight into a 15 km traffic jam. I spent most of the time cycling along the gravelled hard shoulder. I set myself a target of 120 km. I now have some km to make up. So I will have to work hard. I only stopped twice today at 40 km and 80 km. Apart from an apple and a banana I didn’t eat. The heat just didn’t make me feel like it. I just drank lots of water instead. At 80 km I had a lie down for nearly an hour. Up until then the road had been flat. The next 40 km was up and down and with tired legs it was hard to get a momentum. At 109 km I came across a petrol station with a very good looking camping spot. Still 11 km short of the daily target I pushed on. Bang on 120 km I stopped at the first restaurant I saw and asked if I could camp. No problem. So put the tent up had a nice shower, some dinner and I am now writing my blog from the comfort of the restaurant. Bed soon. Will be an early start at a daily target of 150 km. The ferry for Java is still 3 to 4 days away. Camping in restaurants is good and bad. Last night there were a lot of people coming and going. Some guy thought it would be a good idea to sit next to my tent and listen to his music as loud as he could. When I awoke I found two guys sitting on the wall next to my bike. which I didn’t really feel comfortable about. I just got straight up. Packed up the tent and left. I then cycled 40 km before stopping for breakfast. 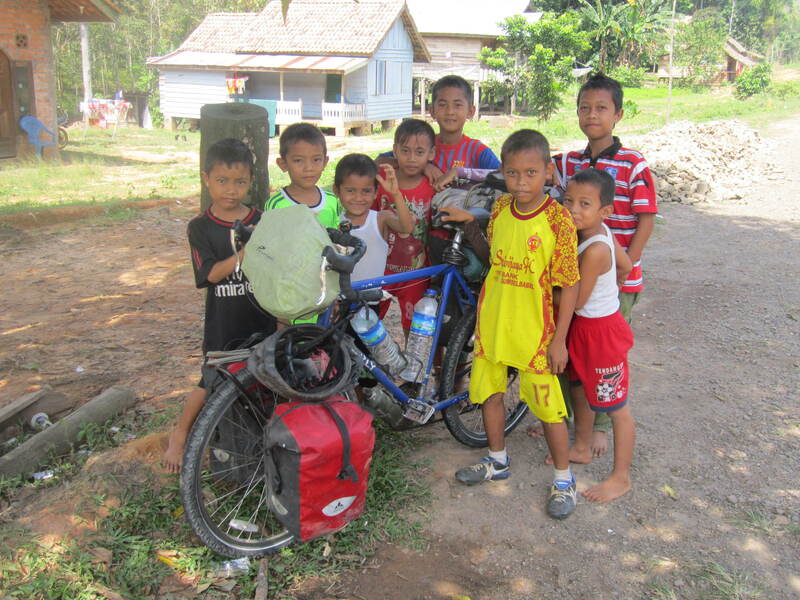 The first village I cycled through was mostly Hindu. Every second house had their own little shrine. There were some larger temples as well and for a main road the road is not big. There is seldom a hard shoulder. But I am lucky the traffic is most of the time very courteous. In the late afternoon a whole row of pet shops sprung up out of nowhere. 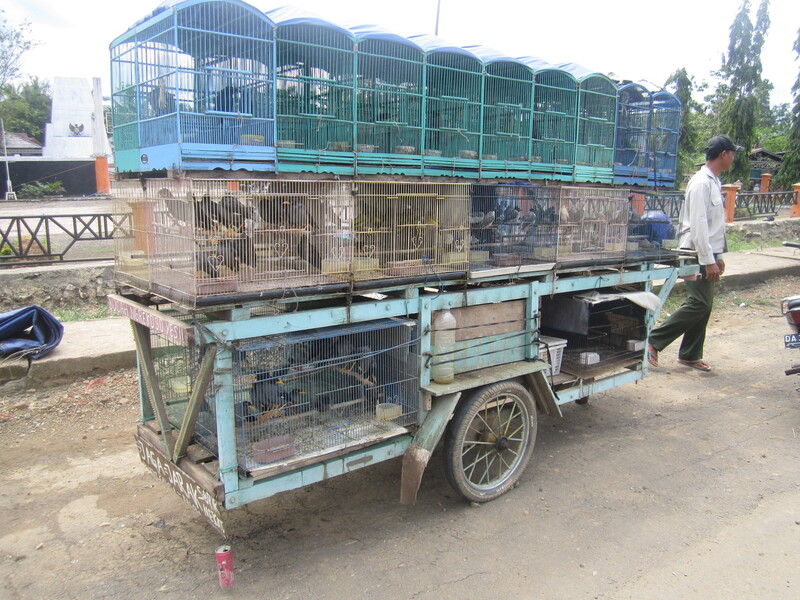 The most saddest thing was seeing the little monkeys in the small cage and out in the baking sun. I was finding it hot enough on the bike. At 110 km the road split and suddenly my surroundings changed somewhat. All the shops and houses disappeared and I was cycling through km and km of sugarcane for as far as the eye could see. After cycling for about 20 km……I came across a guy standing in the middle of the road and selling drinks. I was thinking there’s only one reason he is out here and that is because there is nothing else around. He pretty much confirmed it when I asked him. I cycled on and was resigned to the fact I was going to have to camp wild somewhere. The next problem I had was getting off the road because there was a 2 metre ditch either side. So even when I reached 150 km I had no option but to keep going. I was tired. But it was still light so it was okay. Things always work themselves out. 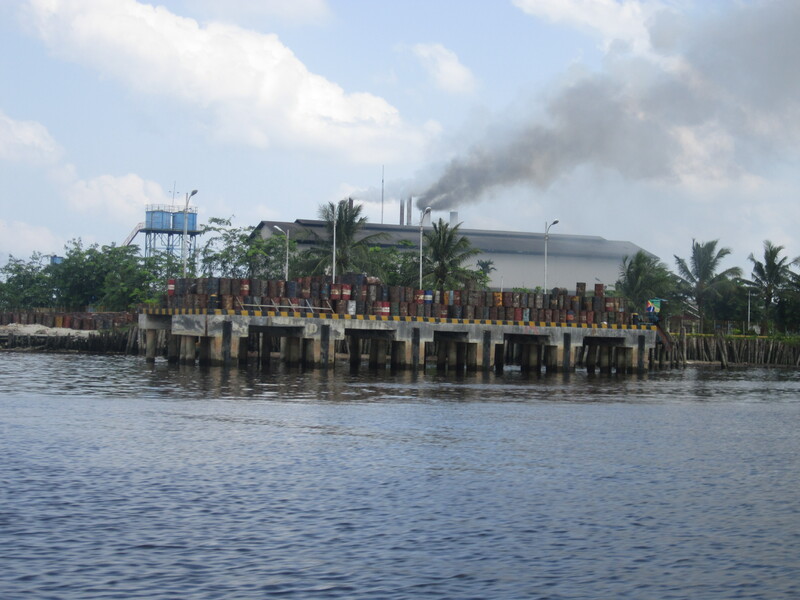 4 km later was a turn off and just 400 metres up the road was the main gate to the plantation and sugar factory. Next to the gate was a field. 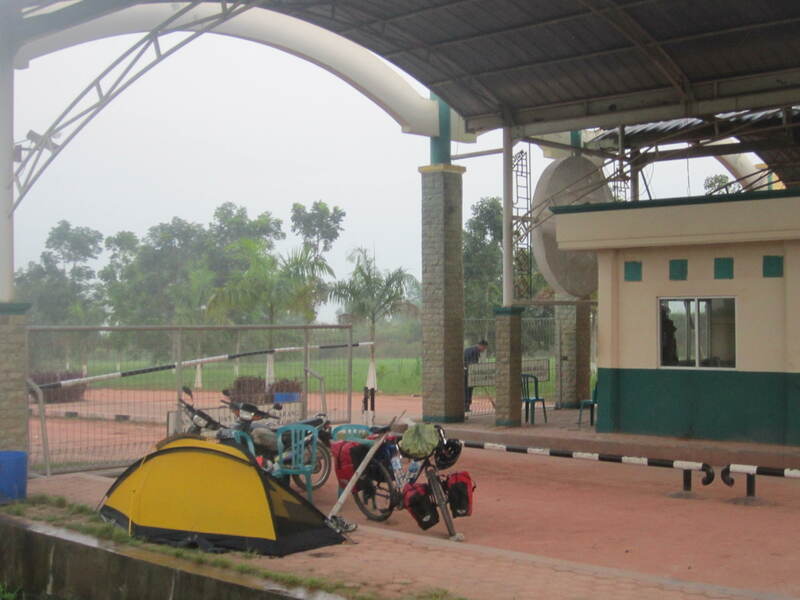 So I cycled straight up and asked the security if I could camp just inside the gate. No problem and they sorted me out a hose so I could have a shower. In the end they got me to bring my tent in from the field and put it under the canopy of the gate. They mentioned the words cobra and lots of snakes, so I was happy to move. It was a very nice red sunrise. The security had changed and the new guys brought me a cup of coffee. I then pushed on knowing I had another big 150 km day ahead. I saw many different crops this morning. The sugar cane disappeared and then there were pineapples for as far as the eyes could see. 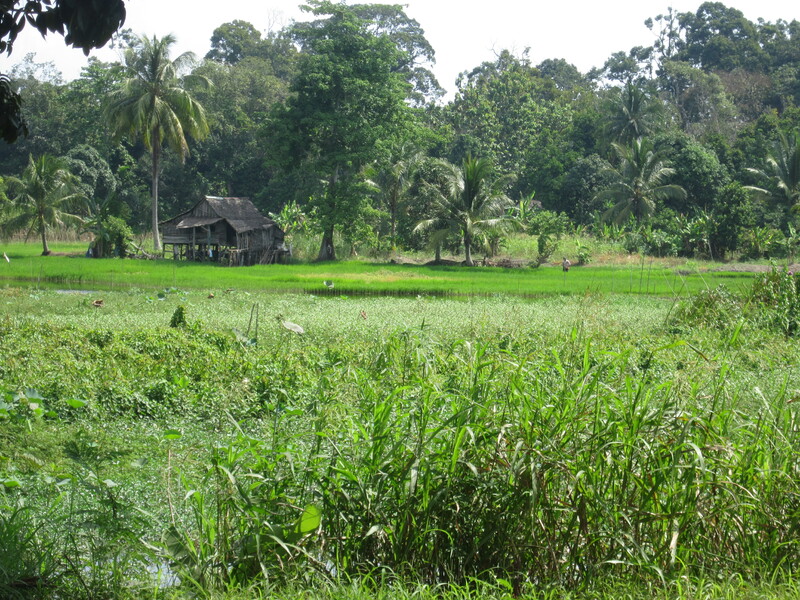 Then it was sweet potatoes and corn between patches of rubber trees, not forgetting rice fields as well. 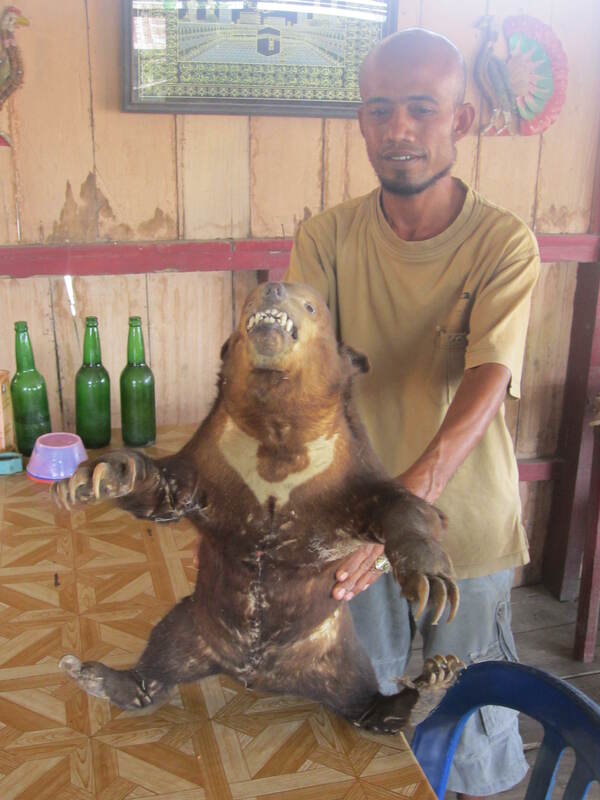 As I have moved South through Sumatra……………the food has changed. Today I could only get chicken or fish. Since I don’t eat fish……….it was chicken, chicken and chicken. I do hope I can find some beef tomorrow. The last few hours were tough……………my legs were tired. So when I saw a petrol station I was straight in there to camp for the night. I have been told I only have 40 km to the ferry terminal for Java. The ferry leaves every 30 mins and it takes 2 hours……………..just the road to the ferry is very up and down. Today was a bit of a split day. I got up knowing I only had at the most 40 km to the ferry. I didn’t hang around and at 6:30 a.m. I was on my way. I did stop for an early breakfast after just 15 km. I was a bit hungry from the night before as I had only had some fruit and a packet of wafers. 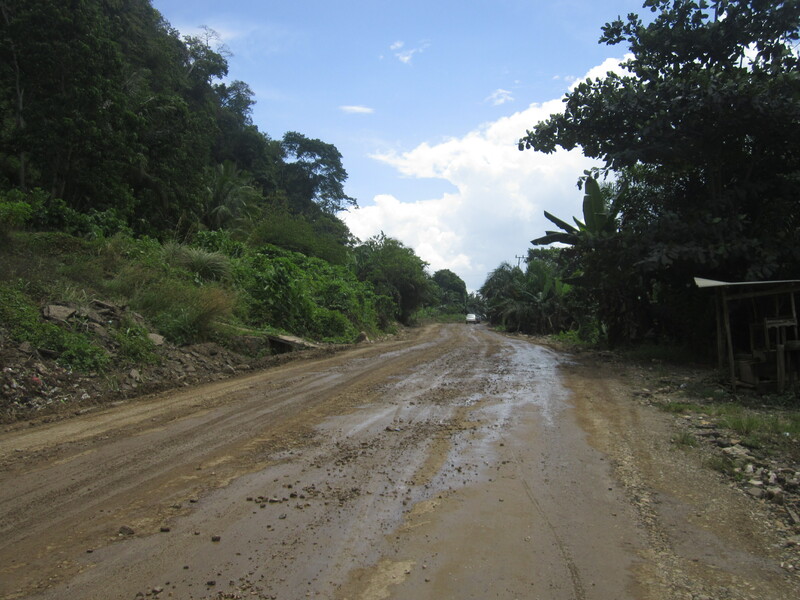 Most of the way the road was pretty flat…….just the last 10 km there were two really steep hills. I stopped on top of the second one for a view of the port. There was a monument you could climb. Just 5 years old it looked like 30 years and was falling to bits. 7 stories up it gave an even better view. I then shot down the hill to the ferry terminal. Was firstly directed to the foot passengers entrance. Ticket was only $2.40. I was then redirected to the drive-on ramp. It’s always nice when bicycles get priority. You turn up late and still get to go on first. It was a pretty big ferry. By the time I got up top there were people everywhere. Finding shade and a smoke-free area is impossible. There are no smoking laws in Indonesia or any no-smoking education. I have people coming up to talk to me and waving their cigarettes in my face. To escape the smokers on the boat, I upgraded to VIP for an extra 0.40 cents. Money well-spent. No-smoking and air-conditioned lounge. There was plenty of room so I could grab a whole row of seats and have a lie down. The movie was rubbish……we even got to see it twice. It was a 1970s Indonesian movie with bad acting and badly made. Boat was meant to be 2 hours but it turned into 3…………1 hour late is probably good for Indonesia. 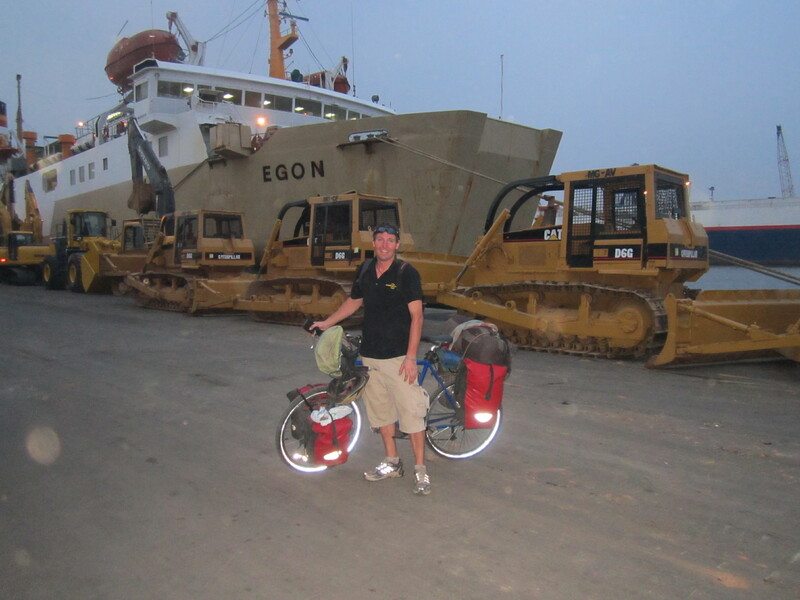 As soon as I cycled off the ferry and down the main road I noticed a real difference with Java. I had heard Indonesia is overpopulated. 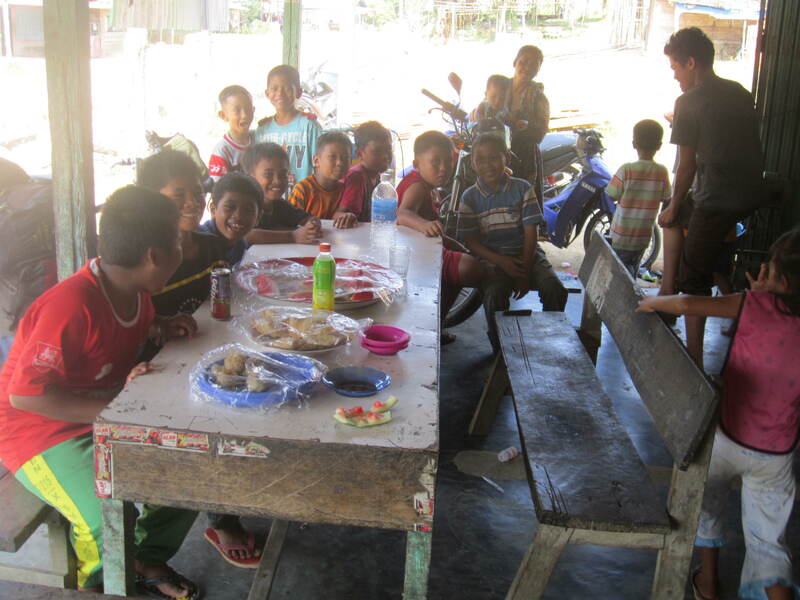 I was starting to wonder where all the people were because for the last two weeks in Sumatra it’s been pretty quiet. The 39 km I cycled this afternoon was intense. Cars and bikes are 24/7 and people are everywhere. The roads are dirtier and there is a lot of smog. At 4:30 p.m. I thought the sun was setting because it was so dark. 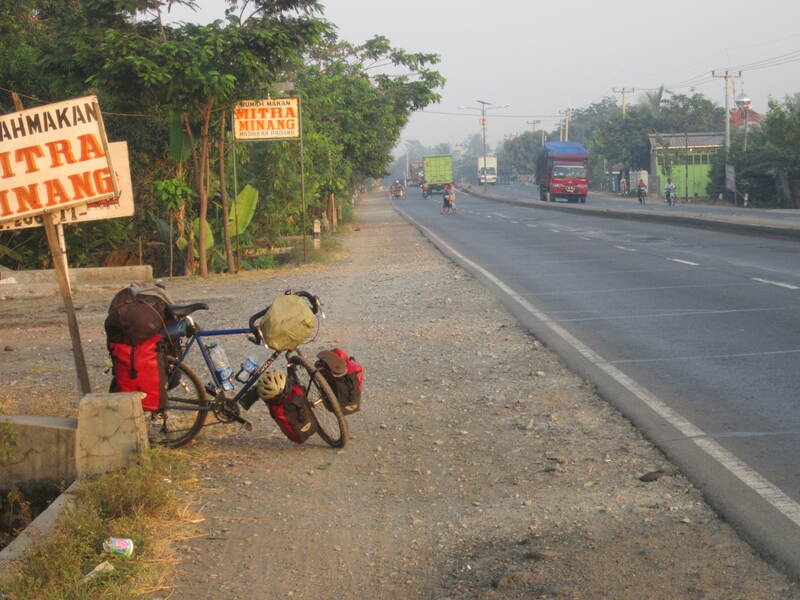 I am now just 84 km from Jakarta. This will make for a nice little run in. 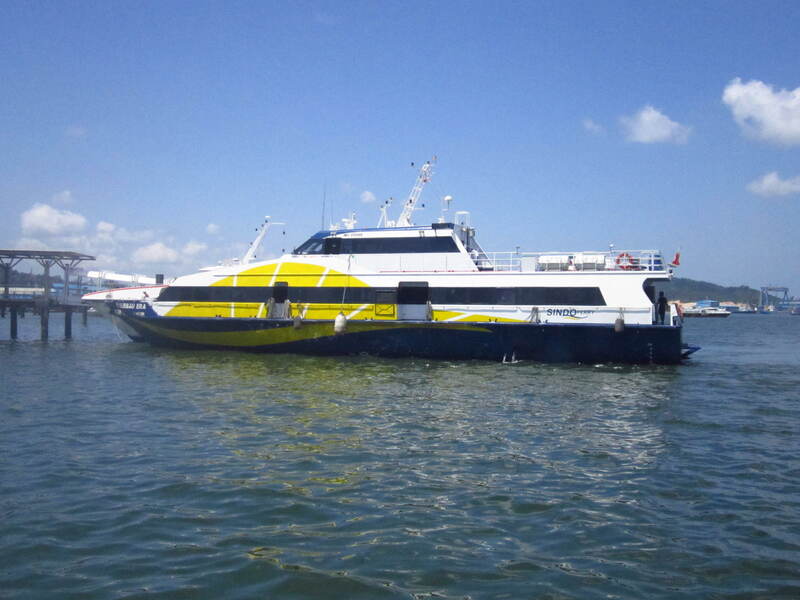 I will go straight to the ferry port to check on ferries from Java to Kalimantan. 4:45 p.m. I pulled the pin and pulled into the good old trusted petrol station. That is where I have camped tonight. I had a guy today stop in front of me and take a photo as I passed. 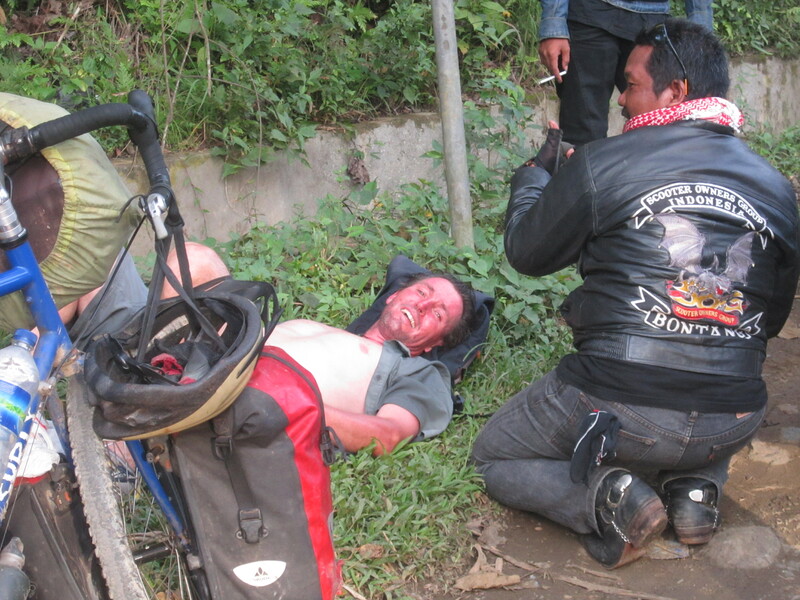 He later caught up with me again and handed me a bag with some cold water and two bottles of red bull and said « Welcome to Indonesia ». 90 km out I started the day in heavy traffic as I headed towards Jakarta. 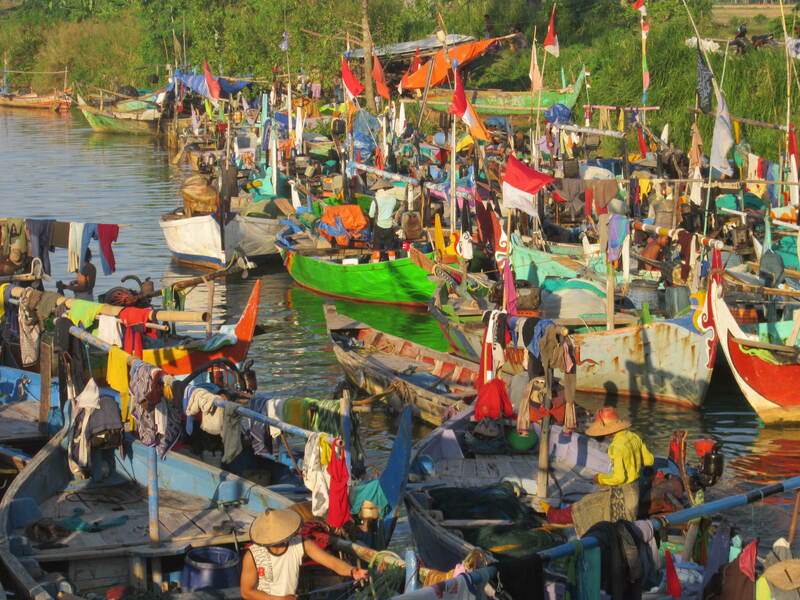 My first stop in Jakarta will be the ferry port where I plan to check on boats to Kalimantain (Borneo). After 20 km I had to stop for breakfast and have a break from the constant concentration needed to navigate the traffic and the fumes that nearly overcome you and leave you black at the end of the day. 45 km stopped again. I ate rice, chicken and an iced coffee all for only $1.20. Just after lunch I got down to the port and went round some of the shipping offices looking for a ferry. One of the shipping companies recommended me to go to Spill. Apparently they had a boat leaving tomorrow which sounded positive. They could take me alright if I wanted to put my bike and myself into a shipping container. None of the non-passenger companies would take me. I ended up at Peli ferries. For a Head Office it was very primitive. The information centre consisted of a blackboard and a list of ships. The only ship any good to me was for the 4th July. But that is one whole week away. Too long to wait. 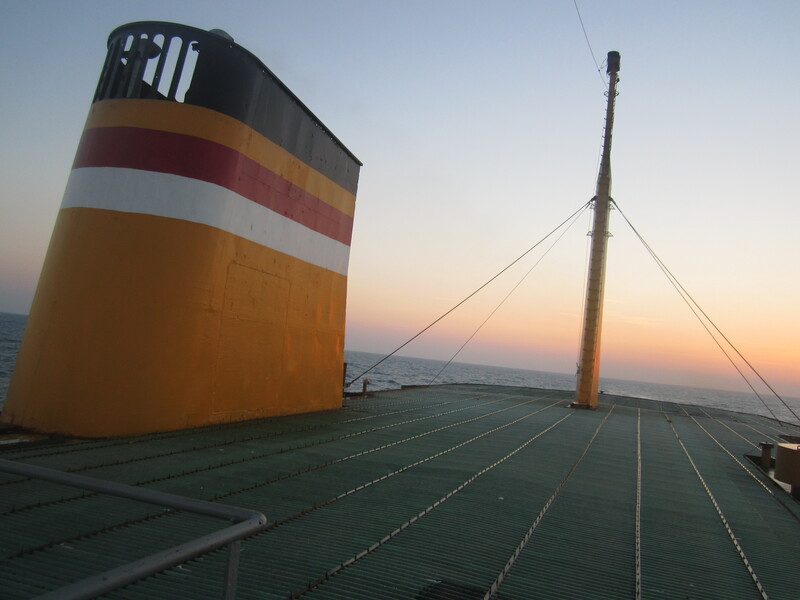 The next option is to get a ferry from Semrang in 3 day’s time and 450 km away. 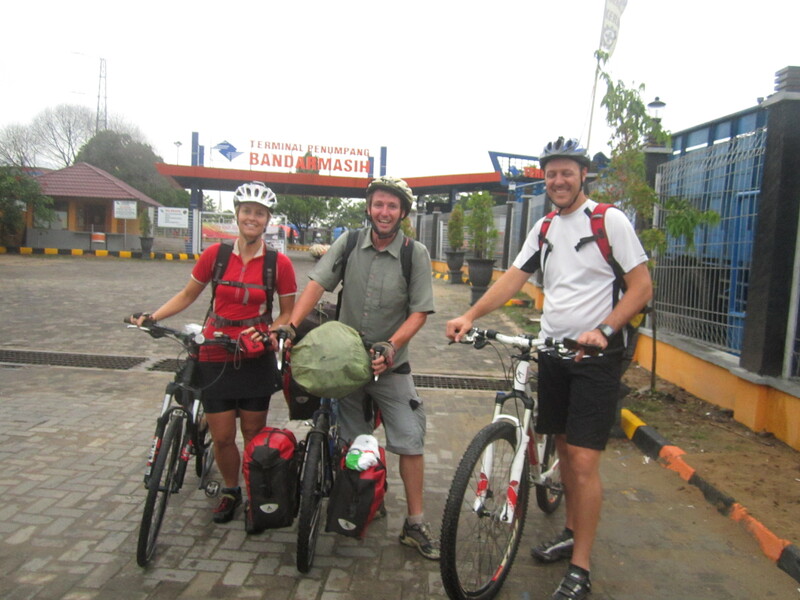 So on the same day I cycled into Jakarta I started to cycle out. I tried a few hotels and they were full…………then there just weren’t any. So just before dark I dived into a petrol station. They weren’t so happy for me to camp. …………..guy wouldn’t give permission…put the tent up……It was nearly dark and wasn’t going anywhere. He wanted me to go down the office 1 km away and ask permission. I wasn’t taking no for an answer and put my tent up behind a hedge………….right next to the road. Good thing about the petrol station there is always a toilet and a place to have a wash……even if it is just a saucepan and a barrel. Sleeping so close to the road was painful. At 11 p.m. there were still traffic jams and the traffic didn’t let up much all night. At all hours there was a tooting of horns. In the morning the petrol station staff warmed to me and invited me for breakfast. 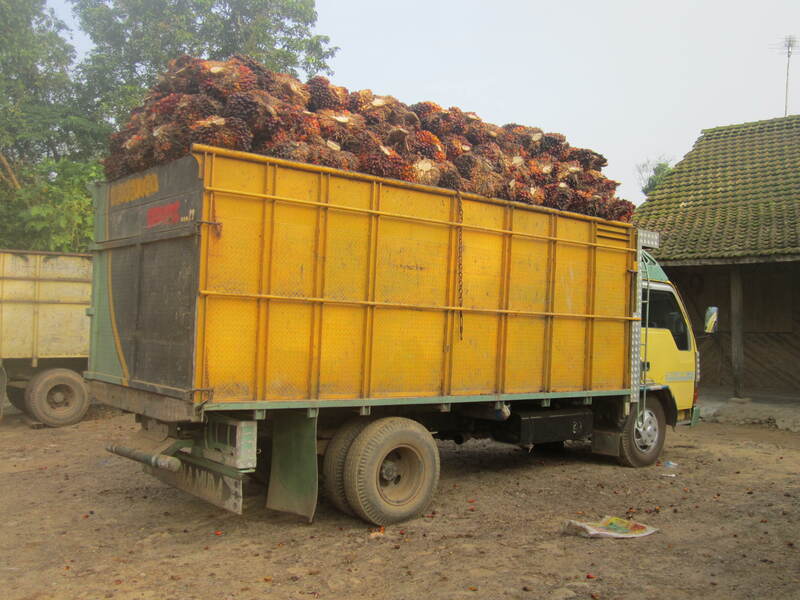 I made a good start yesterday afternoon getting out to the outskirts of Jakarta. It now gave me a good chance of covering the 450 km to Semrang in time to catch the ferry. It will mean I will have to do 150 km every day for the next 3 days. I got caught in heavy morning traffic and got a little bit lost in trying to find the main road out. When I did finally find it – it made life a lot easier. Things were going well by midday I had done 80 km. I stopped for lunch and was soon on the move again. 20 km later my bike started to make a bit of a noise. Then it became impossible to pedal because the chain kept getting tangled up on itself. I pulled over and went down a small drive to a shop where I parked up in the shade. I then gave the chain and bogie wheels a clean. Hoping that would help……………..but no. I then took everything off the bike and soon discovered the rear hub had completely seized. The son from the shop said there was a mechanic further down the road. So I jumped on the back of his bike with the back wheel. At first I thought it was just the bearing. Things were looking promising. The mechanic replaced them…………this didn’t work either. After 3 hours we gave up. I went back put my bike back together and loaded up. 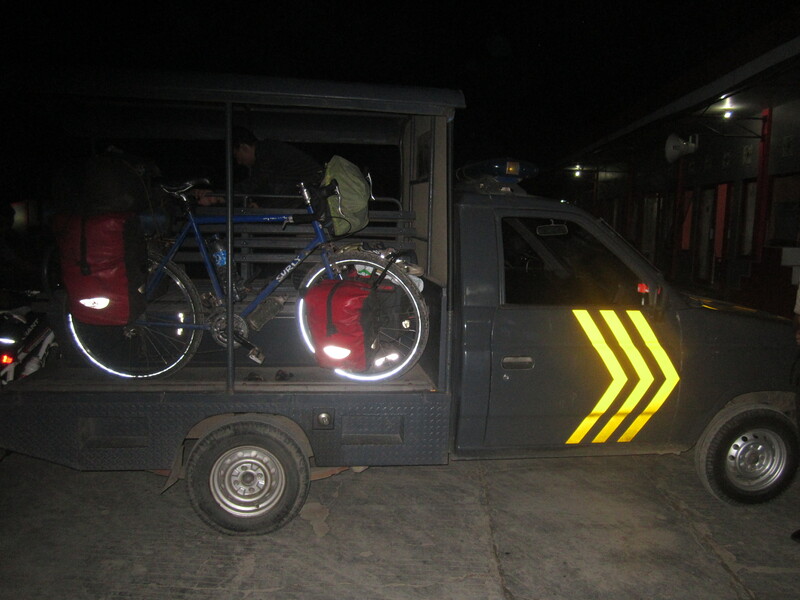 I then pushed by bike half a km down the road to the Police station where I went in and said I needed somewhere to sleep for the night. 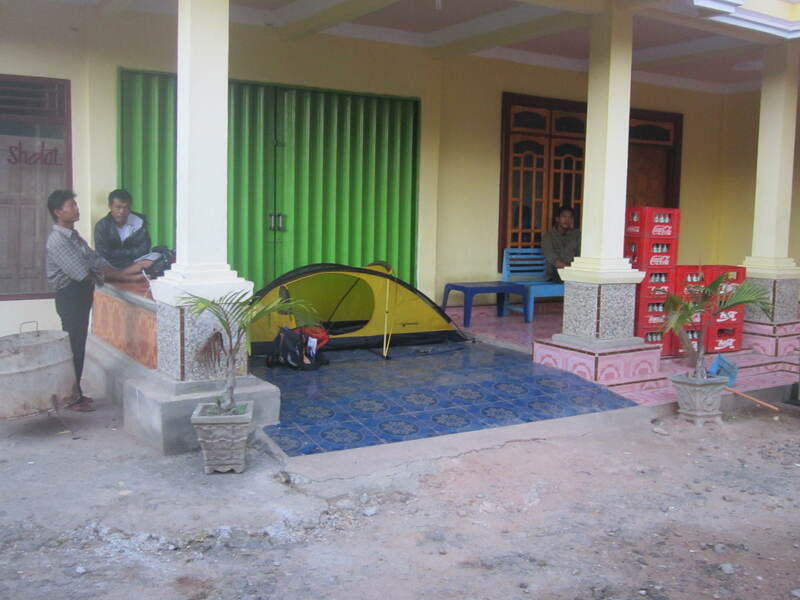 They took me around back and I set up my tent on the porch of the mosque. I was feeling pretty low tonight. I have no option but to go back to Jakarta tomorrow for emergency repairs and there is no way I am going to make the ferry from Semrang now. I slept very well at the back of the police station. It was nice and quiet and made a change from all the traffic noise from the nights before. I did wake up dreading the day that lay ahead. I didn’t put it off and packed up straight away. 6:30 a.m. I was out on the side of the road feeling pretty low. 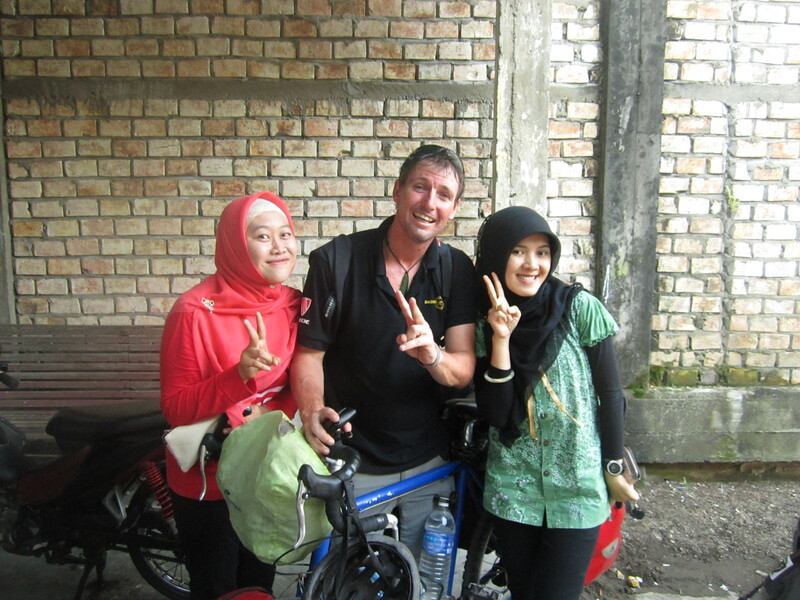 With my bike broken the best option is to go back to Jakarta and get it fixed. The first vehicle to stop was a minivan/bus. It was a struggle to lift the bike up on to the roof. For $3 it took me the 20 km to the next big town and the bus terminal. Waiting for the bus I got rice, beef and a cup of tea for 0.70 cents. I got a bus. For $5 I got the whole 6 backseats for me, my bicycle and luggage. It was a smoking bus………..which is not so pleasant. I should have seen it coming. 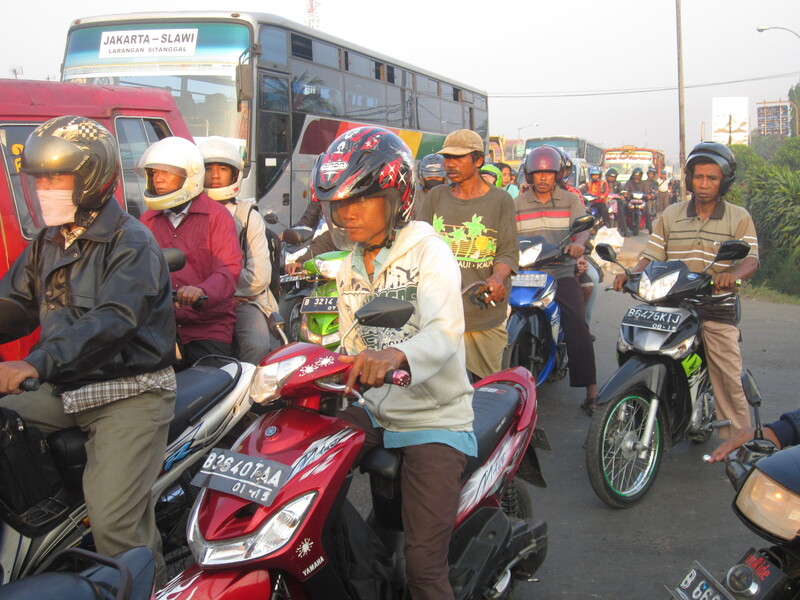 The Jakarta Eastern bus terminal was 16 km from the centre of the city. I was going to get a taxi for $10……….which soon turned to $20…………………so I told them to forget it. I started pushing/cycling slowly/pushing my bike into the city. After about 8 km a really bad situation turned good. I had a young law student stop and ask me if I needed any help. He spoke perfect English and said he was surprised to see me. You just don’t see bicycles with all the luggage here. I didn’t say no when Minks kindly invited me to his apartment which was close by. Things got a lot better because he even took the time to drive me around a very busy Jakarta from one bike shop to the next till we found a place that could fix my bike. After a few had said no, I was feeling a little nervous. I am a lot more relieved now knowing my bike should be good to go again tomorrow. Unfortunately I won’t have enough time to get to Semrang to catch the ferry. I will now have to wait here for 4 days. Between bike shops we called in to see Mink’s girlfriend Marrella who works at a restaurant in the Indonesian mall which was just massive. With lunch I had two beers which tasted great after such a long time…………but did go straight to my head. Tonight I am catching up on my blog while Minks has very trustingly left a perfect stranger in his apartment while he goes to a wedding. Day 456: Wasn’t really a rest day. I had to go first thing to the bike shop to drop off the front wheel. Since I have to replace the rear hub after 23000km, I figure I should really replace the front hub as well. The next thing I want is the front hub failing in the middle of Borneo. Just a few hours after dropping off the wheel I was able to pick them both up. I got the train back to Minkee’s apartment. In the morning the train was quiet. When I jumped on I jumped straight onto the women’s only carriage. This fact was quickly pointed out to me and I moved to the next carriage. Coming back the first train was so packed that I decided to wait for the next one…………..which then took ages. So when the next one arrived……..even though it was packed……….I thought I’m getting on here no matter what. Then as soon as the train started to move on I realized the doors didn’t close. Luckily it was only 2 stops because I was left holding my two wheels in one hand while with the other holding on for dear life. One shove and I would be out the door. 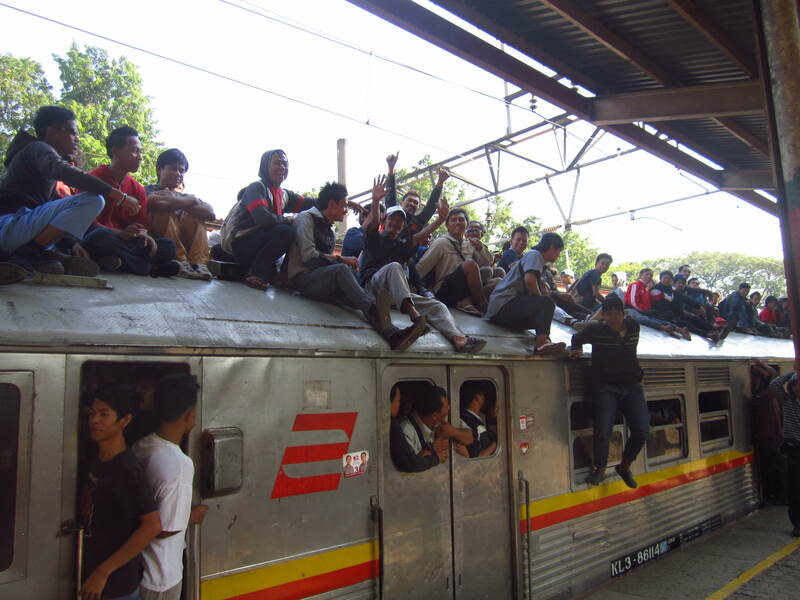 Trains in Indonesia are crazy. Last night I watched a train pass at the crossing. It was so packed that even the roof was full of people. There were even people hanging off the back of the last carriage. 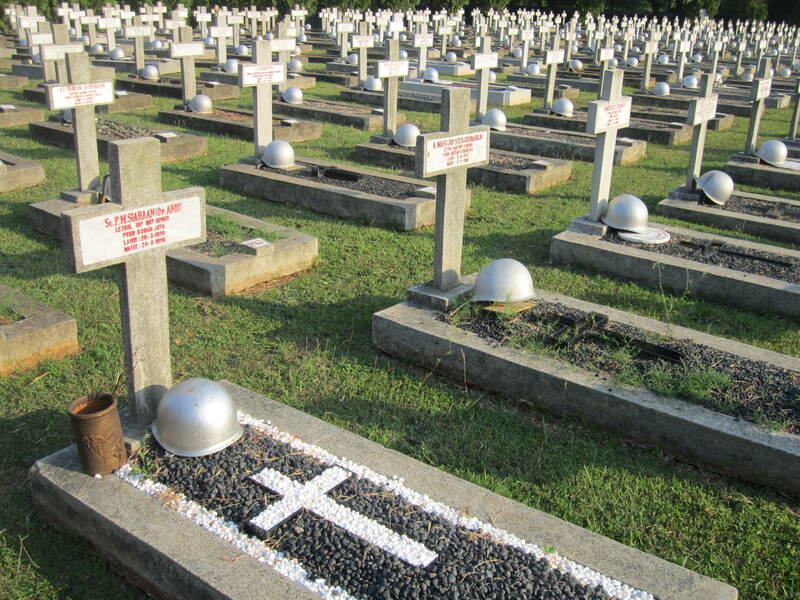 Just a short walk from the apartment is the Indonesian National Military Cemetery and Memorial. It was an interesting walk around. Every grave had a helmet on it. At the back of the cemetery was a section with all Christian graves. An interesting thing here is that a lot of the names were English or Dutch. 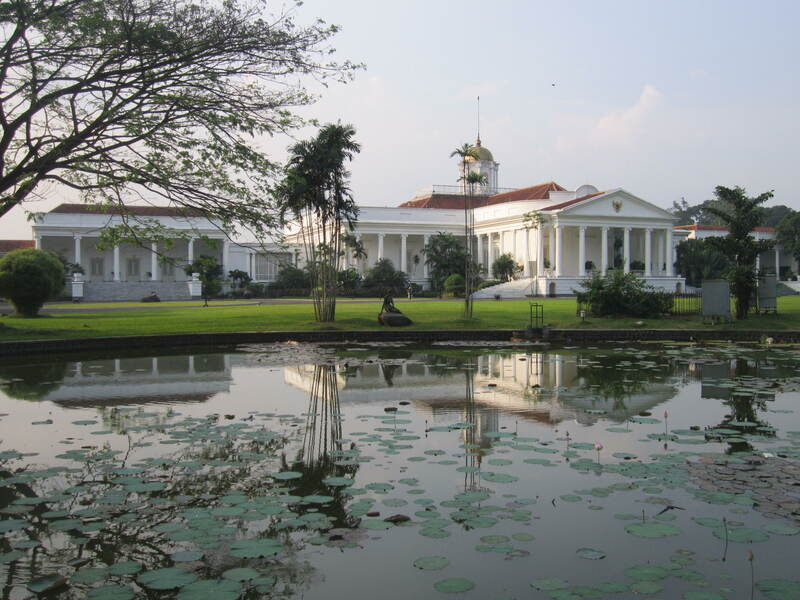 Day 357: Sunday – I thought I’d better see some of Jakarta since I am here and I have the time. I ventured into the old part of the city on the train. Thankfully it wasn’t crowded like the day before. The plan was to just wander and I had heard that there were a few museums around. I wandered straight across the road from the station to the Bank museum. Only 0.20 cents to get in. It was actually very good and I spent over an hour exploring every inch of the bank from the vaults to the old Boardroom. I then went through Chinatown. Stopping off to look at a big temple. Outside the temple were heaps of beggars. Changing direction I went back past the train station and walked the pedestrian street with its many Dutch colonial buildings. 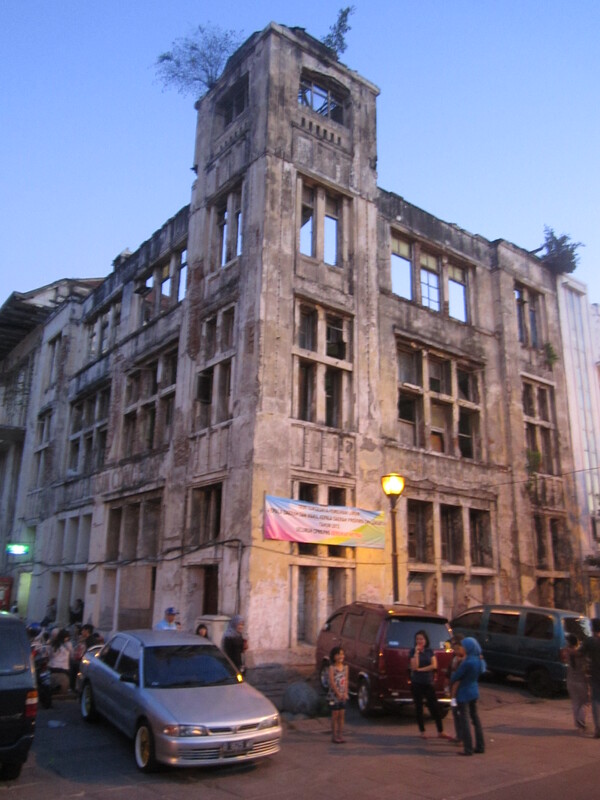 Many of which are in ruins. Day 358 : Monday – With some down time I thought it would be a good idea to go to the Timor Leste Embassy and apply for the visa and after that go and get my ticket for the boat on Wednesday. So at 8.30 a.m. I was down the station. The first train that arrived was completely full. There were loads of people sitting on the roof. There were even people standing on the outside between the carriages and some even crazier ones hanging off the back…………..I had to wait two more trains before it was safe to get on. Finding the Embassy wasn’t easy. I found the road okay. But for 1 hour was directed up down and around. Tried to call the Embassy………phone was disconnected. Finally discovered the building name had changed. I then got a bigger surprise when I got up to the Embassy and was informed that the Jakarta Embassy doesn’t issue visas. I couldn’t believe it……………what a waste of a morning. 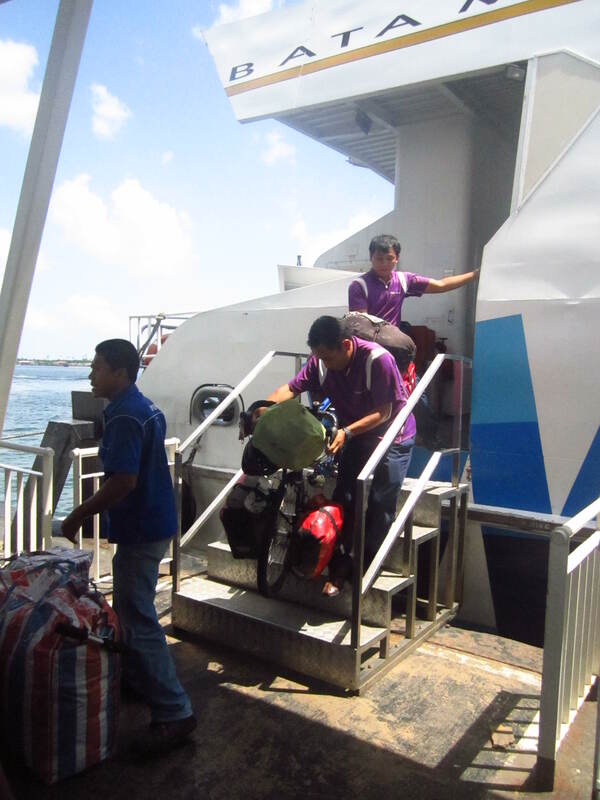 Options are visa on arrival in Dili. I’m not flying so that’s not going to happen, Bali or Kupang. Not going to Bali. So it is only Kupang. Her words were that it won’t be easy. Just what I wanted to hear. I had better luck with the ferry ticket. But that nearly went pear-shape as well. Got there just before 3 p.m. You have to fill out a form and wait. While I was waiting I went out to get a drink. Got back and the office was bloody closed. I was lucky I got back in through a side door. I have the ticket………..so all is good for a Wednesday departure. 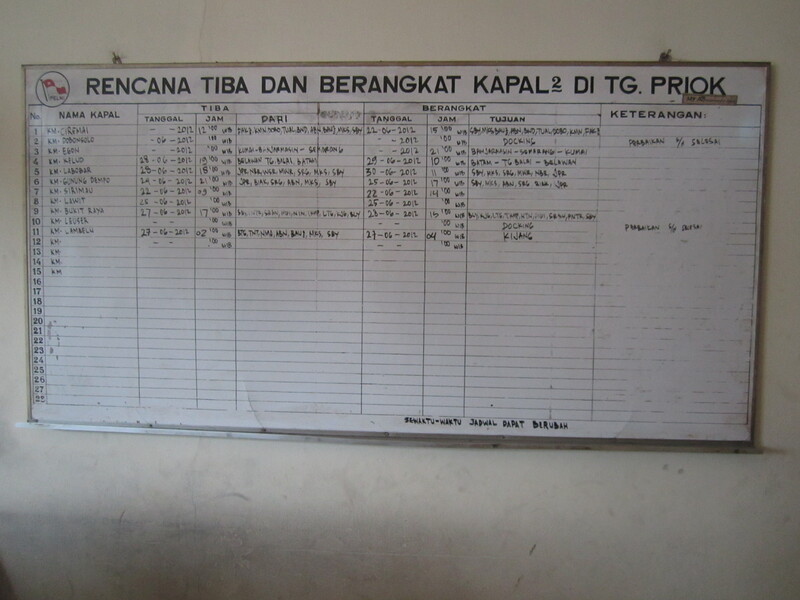 Day 359: Tuesday – I took the chance today to get out of Jakarta by taking the commuter line to Bogor. A city about 50 km away. 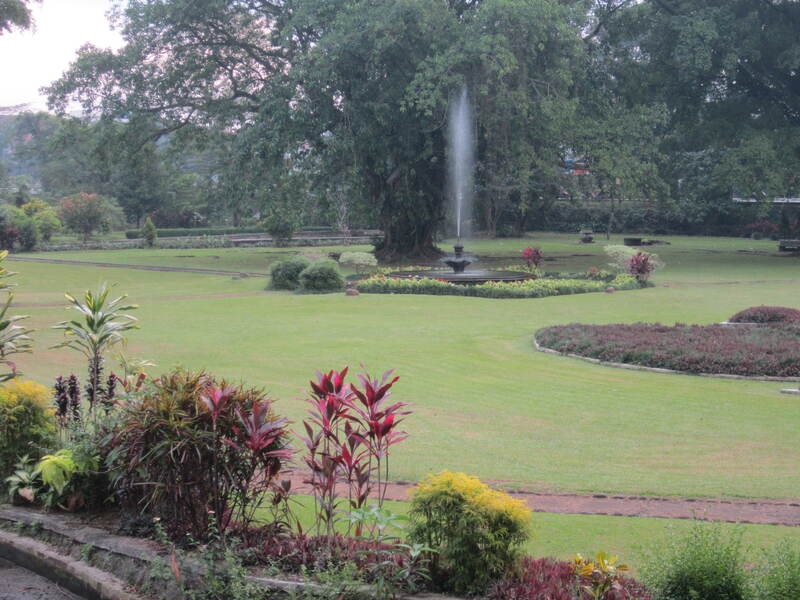 The main draw card for this town is the botanical gardens. Next to the Botanical gardens is a place with its huge grounds which are full of roaming deer. Pretty tame because from the fence everyone feeds them carrots. 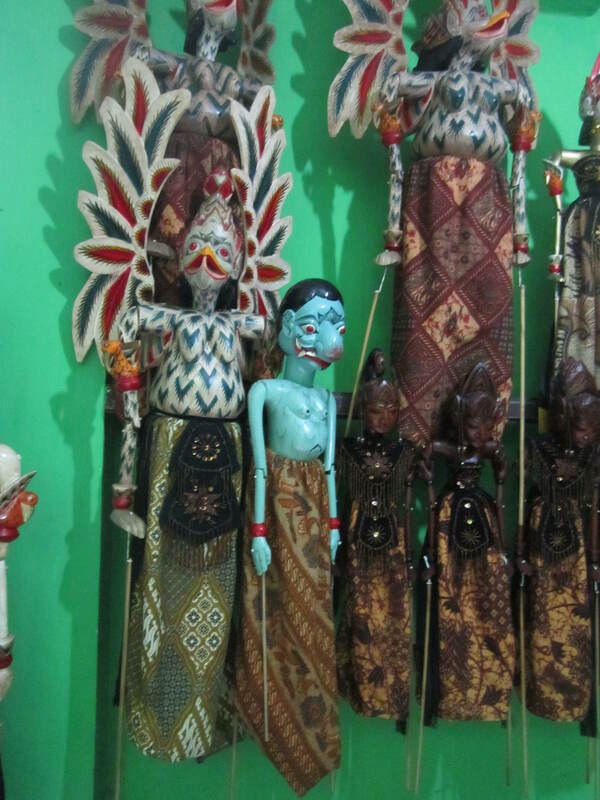 I was just walking around and exploring and I met a guy who took me to the house of a guy in a small village that made wooden puppets. They were nice and I think the catch was they were hoping I would buy one. 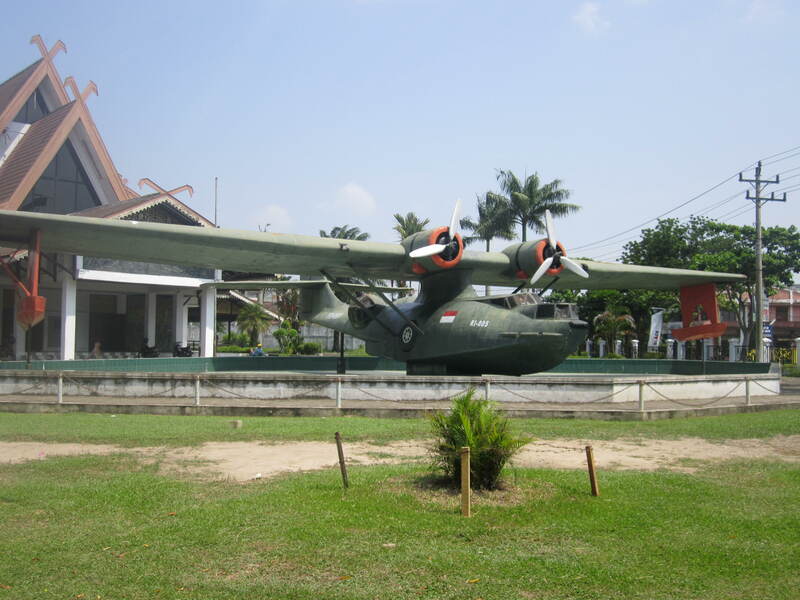 I found the PETTA museum which was about the establishment of an Indonesian army with the help of the Japanese. Later Petta fought the Japanese before fighting the Dutch for their independence. 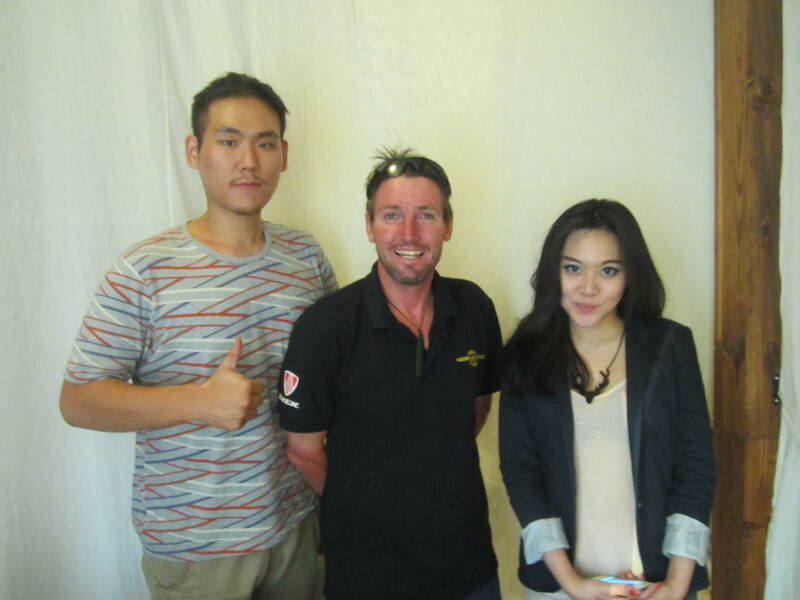 In the afternoon I caught up with a guy called Benz who I had met in Hanoi and lives in Bogor. He gave me a ride up to the botanical gardens and we had a good walk around the very well-kept gardens Some of the trees were over 150 years old. In the middle of the gardens was a small Dutch cemetery. There were a few ponds with giant lily pads and lilies, a cactus section and an orchard house. Overall the gardens were rather impressive.When it comes to eating some Asian countries such as Indonesia don’t use chopsticks. They use their hands instead of a knife and fork or they use a combination of a fork and a spoon. In resturants it is often a topic of conversation when I the foreigner uses only a fork. They think I am struggling and bring me a spoon. After 5 days in Jakarta I have got into a bit of a routine. Every morning I go into the alley behind the complex and have my breakfast…………..rice and beef or rice and chicken with an iced coffee. 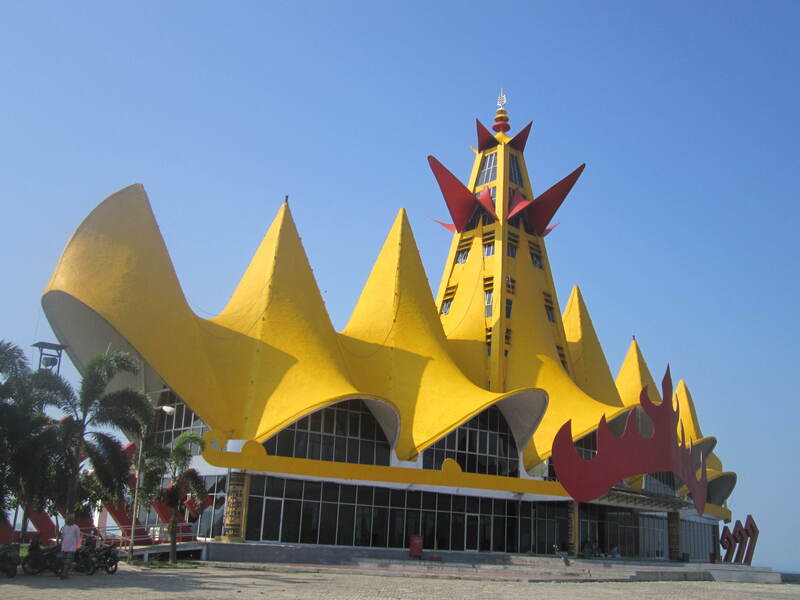 Tonight I have a ferry to catch to Banjarmasin, Kalimantan, East Borneo, Indonesia. So today I will just hang around the apartment complex before heading off about 3 pm I met Minke for lunch and to say goodbye before he had to go back to University for an exam. In the 5 days I stayed I hardly saw him. He was busy with exams and work. It was so very good of him to let me stay and the trust he showed in allowing me to come and go as I pleased. After lunch I was completely caught by surprise when Minkee gave me a traditional Java shirt with the Java pattern. It was such a nice gesture. Just after 3 p.m. 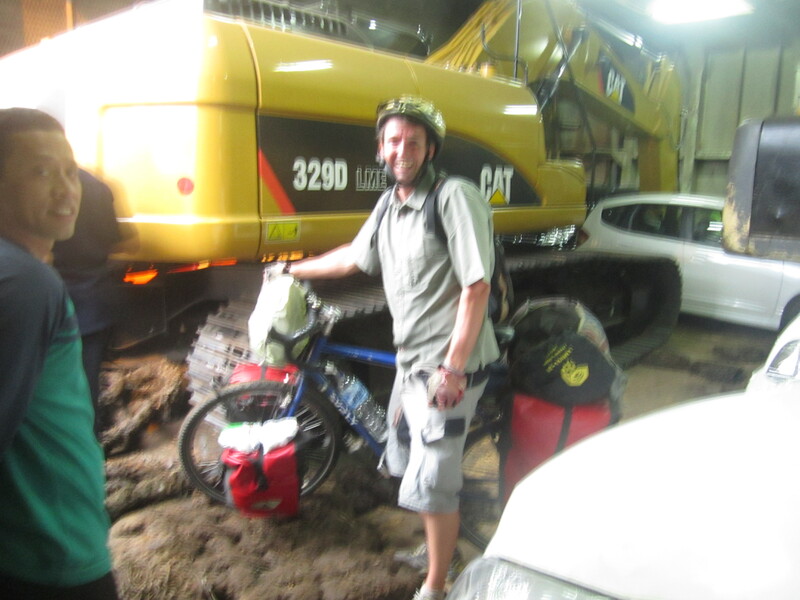 I started my 25 km trek across Jakarta…………….it was pretty straight forward. I just had to find one main road and follow it. There was a lot of traffic to negotiate as at peak hour traffic was starting to build up. 3 km short of the port I stopped for dinner. Just as well because there was nothing at the ferry terminal. The port is massive and I was having difficulties finding the passenger terminal……….even when I found it I still wasn’t sure I was in the right place. I was hours early. Everyone else was waiting for another boat. Security were being a bit awkward. 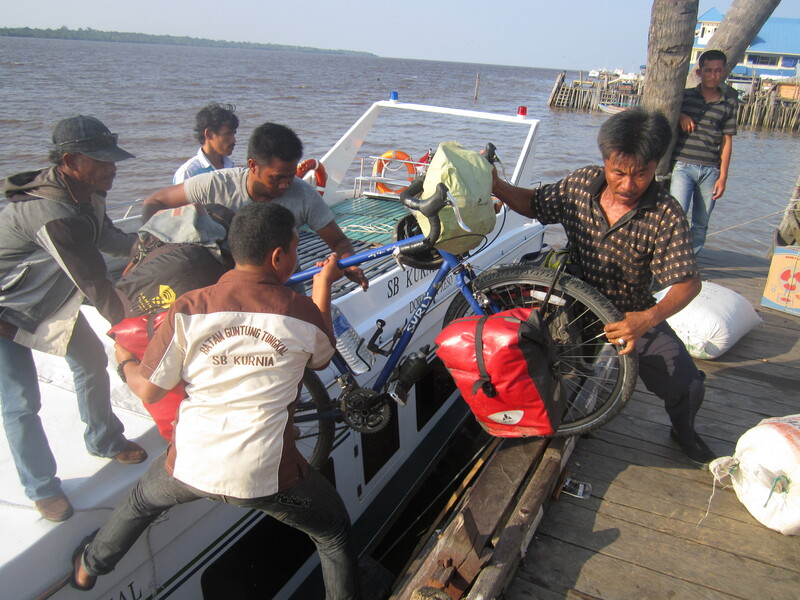 They were making me wait…………………..I overheard 3 locals ask for the gate for Egon, the boat for Kalimantan. They went through. I thought I’m not waiting any longer and went straight through the gate and passage on to the wharf. The locals in front boarded through a hatch on the side. With my bike I had to go up the vehicle ramp. The crew wanted me to leave my bike on the vehicle deck. I convinced one to help me carry my bike up the very steep stairs to the passenger deck. The ship is a Roll on -Roll off taking only vehicles and a few passengers. It is very basic with few facilities on board. I had the whole 2nd class lounge to myself. Everything in it was broken. Very old and dated. I set up a bed on the couches by the window. 3rd class you just get a floor space and a mat to sleep. The class below that you sleep outside on the upper deck. The boat was due to leave at 9 p.m. But it wasn’t until midnight that we started moving. 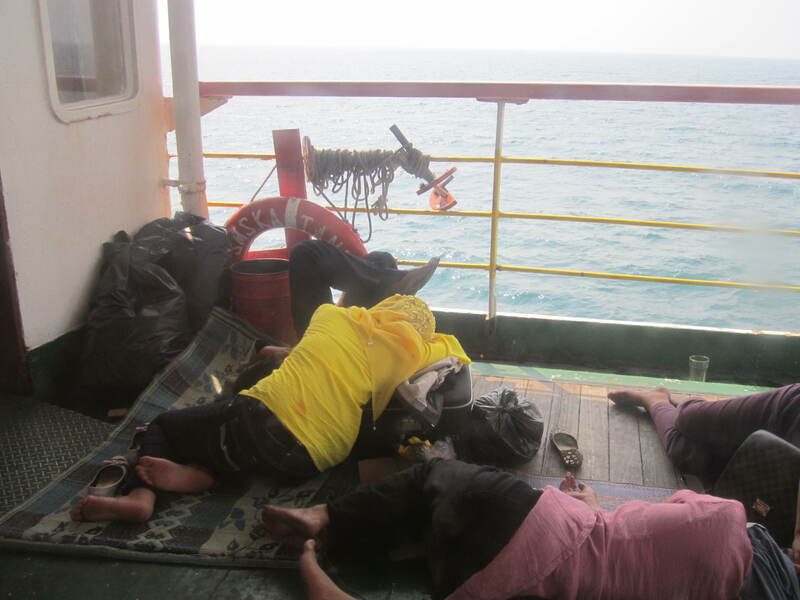 I woke up at 2 a.m. as the boat was now in open sea and things were a bit rough. The day on the boat went pretty quick. I slept well – saying that I was woken by the call to pray. They even have it on the boat. I got up at 7:30 a.m. and breakfast was waiting for me……looks like meals are included. It wasn’t great………….but at least it was something. It was choppy this morning. I was left feeling a little green. 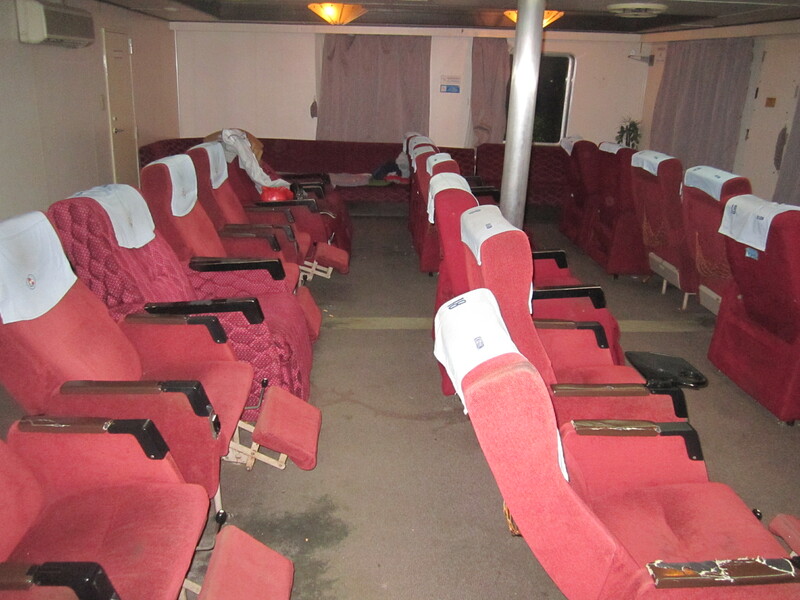 The 2nd class lounge is at the front of the boat. The waves were breaking and the spray was hitting the window. I had another sleep and when I awoke lunch was waiting for me. Rice and a token mouthful of chicken. Every few hours I would go up to the top deck for some fresh air and to have a look to see what was around……………nothing just a few boats in the far distance. 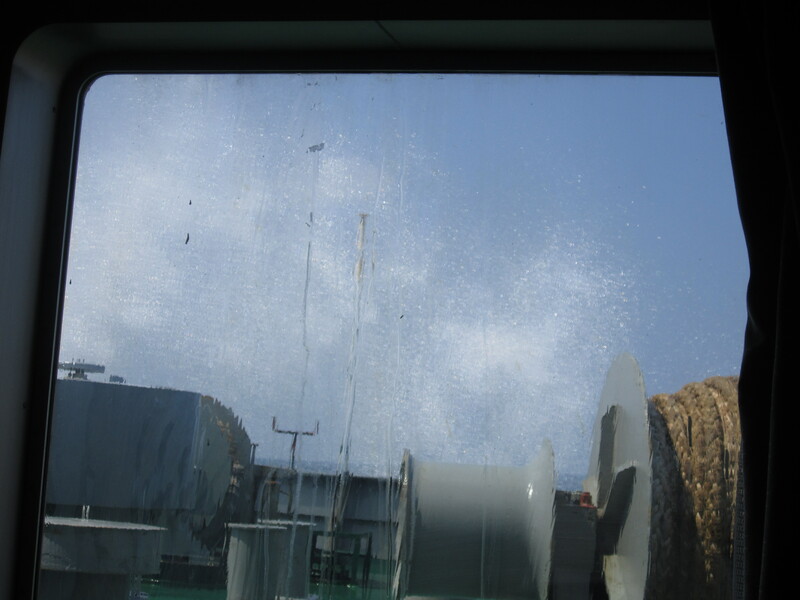 Even from the middle of the boat…………the spray from a breaking wave would get you. Early afternoon we passed a small boat getting tossed around. The Egon sounded its fog horn and it had to break away because it was in our line and a collision was imminent. On the horizon I could see a boat……………about 3 hours later we finally caught up to it and passed it. 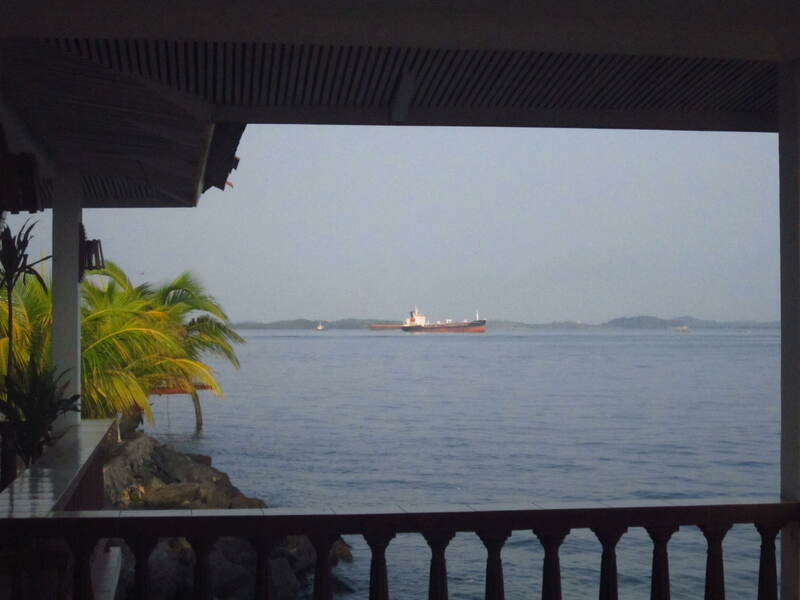 We also passed a small tug pulling a barge on a 150 meter cable…………………Late afternoon seagulls appeared and so did some islands. 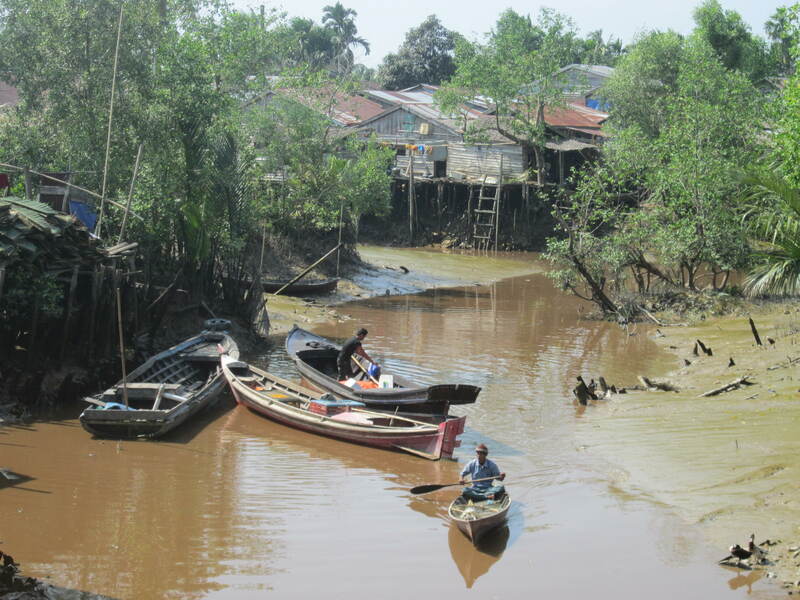 There was excitement on the boat because there was a mobile phone signal………………..only for an hour. 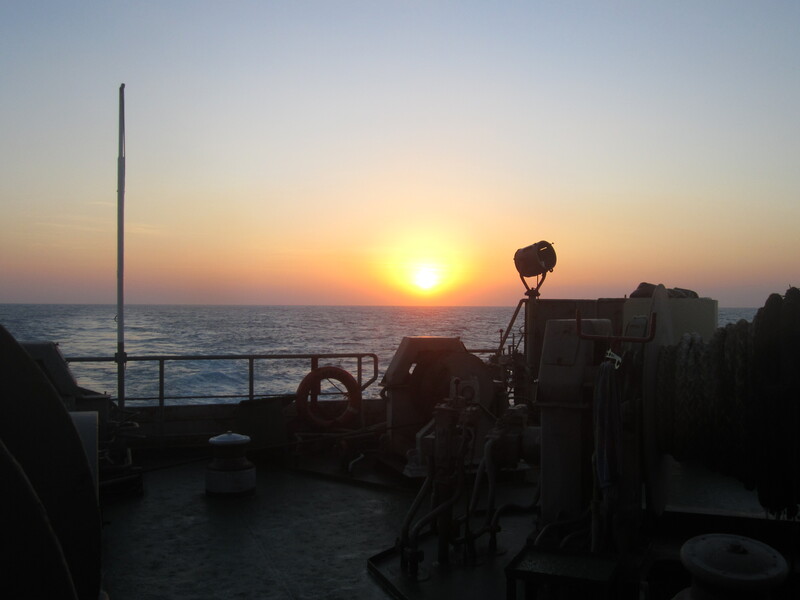 At the same time I watched a nice red sunset off the back of the boat. It was a quiet night on the boat. I had thought about getting up for the sunrise. But it was well up before I moved. Two evenings before we had sailed 3 hours late so I expected our arrival time would be delayed by the same. We were due to arrive at 11 a.m. so I logically thought we would be in port by 2 p.m.
Come lunchtime my GPS clearly showed we were still a long way from land. 2 p.m. came and about 60 km out mobile reception returned. 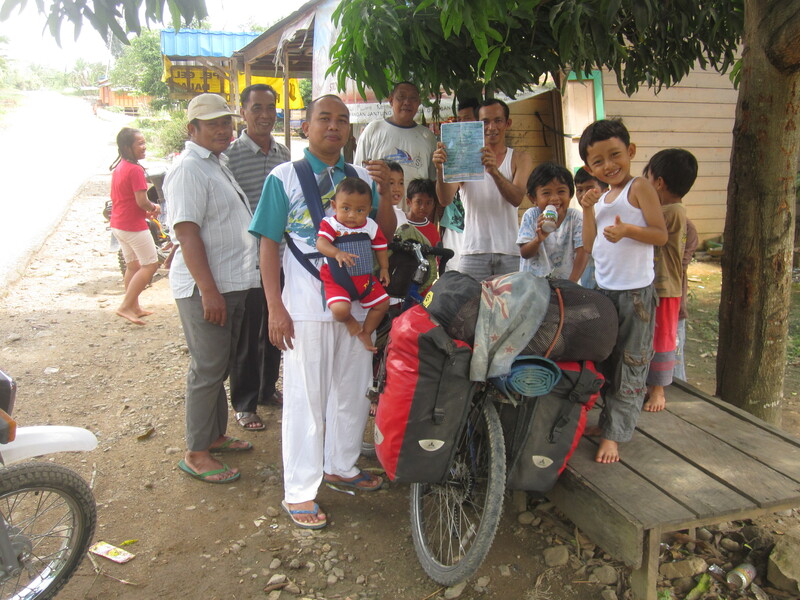 I had a few messages from my friend El who I am going to visit in Balikpapan…………..a 500 km cycle from Banjarmasin. She had warned me. The messages read. Just arrived at the airport………wait for us. We have come to cycle with you. So well I was pretty excited and eager to arrive. So when I finally arrived at 5 p.m. after a 41 hour/960 km boat trip. I had two people with bicycles waiting for me. El had brought her neighbour Adrian along to cycle as well. The plan was to cycle straight out of town and get at least 50 km knocked off. 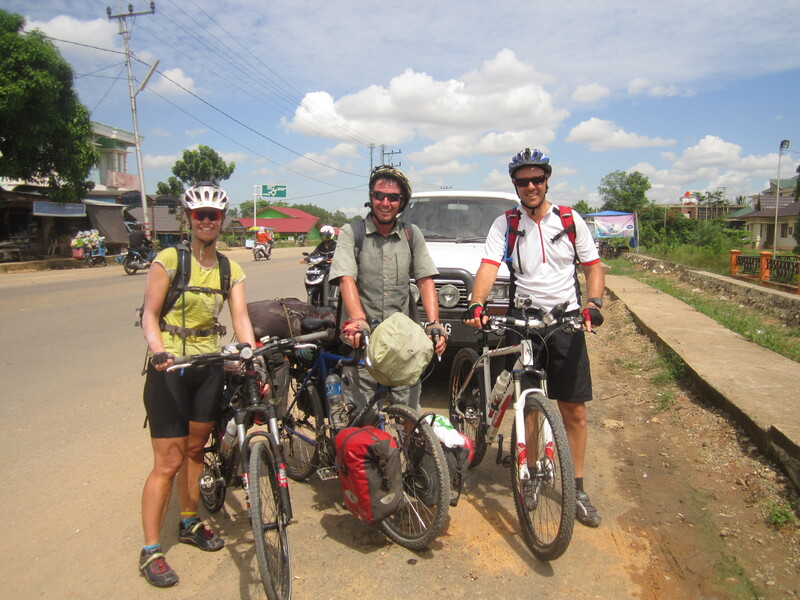 But with the late arrival it was pointless to leave town so we cycled straight to a hotel for the night. The hotel was nice. 6:30 a.m. the 3 of us went down for a very nice breakfast. Cooked meat, fresh fruit and cereals. It was good fun to have some company for a few days. El and Adrian were a bit worried they might slow me down. There were no worries there. 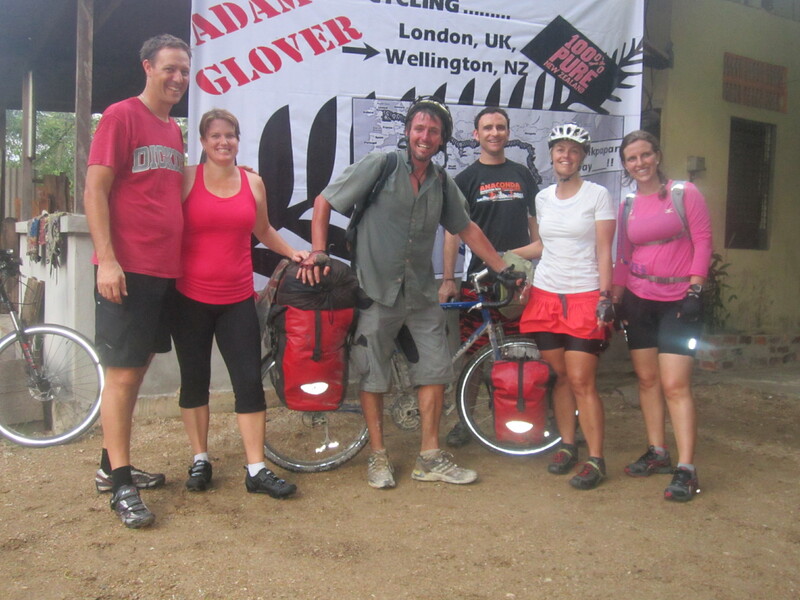 We set a cracking pace and they did really well with not much training because I worked them hard………making them do 150 km. When we reached 150 km it was late in the day and we were between towns. No hotels around. Everyone was pretty tired. 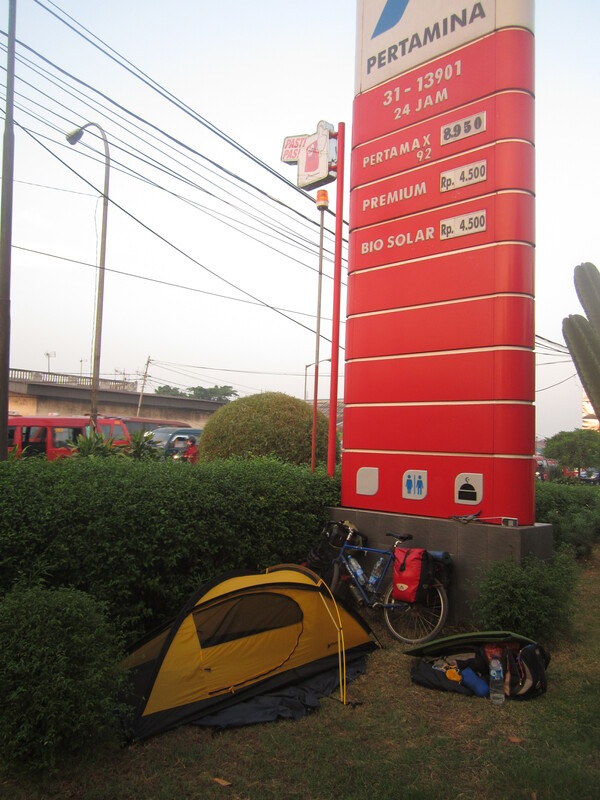 We stopped at a petrol station and enquired about somewhere to sleep. We were directed to the mosque. So it was a good result. We all had showers and cleaned ourselves up. Went out for some dinner and came back for a early night. Our sleep was interrupted when the owner who had directed us to the mosque came in switched the light on and started ranting. A whole lot of other people came into the mosque. They were sitting on the floor smoking. We were told one of them was the police and he wanted to see our passports. 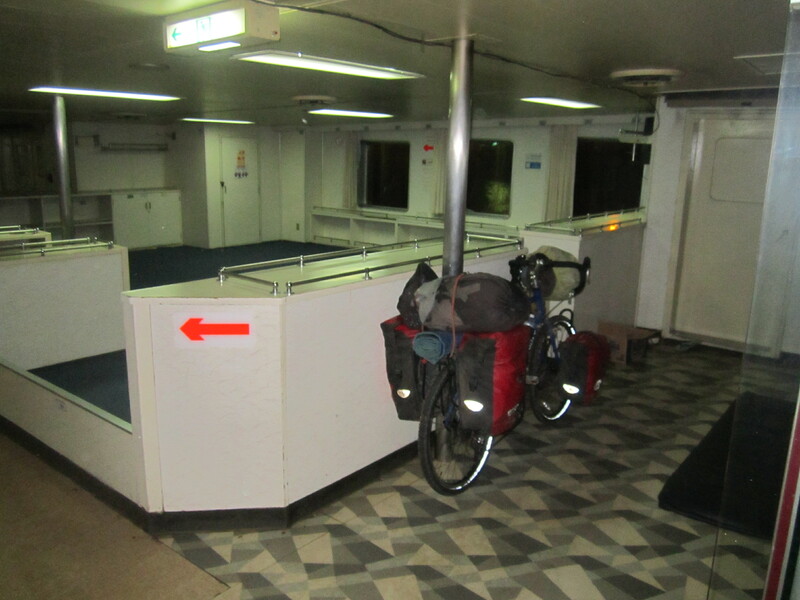 In the end the bikes were offloaded and we all took photos before we finally got back to bed again just before midnight. I joked in over a year I have never had this problem before………..and only the arrival of my new companions has caused me grief .But really it just adds to the adventure. I also joked that we would have to return to the petrol station tomorrow to complete the missing 15 km……………………………not surprisingly this was refused and it was suggested I get up early and return on my own……………………like my motto says never cycle back. It wasn’t a flash hotel we stayed in last night. But as soon as we opened the door. It was a surprise because a breakfast arrived. It wasn’t too bad either. We were all tired and didn’t move at anywhere near the cracking pace we sat yesterday. I think my companions El and Adrian were a bit sore as well. About 11:30 a.m. we got to Tanjung. This is where after 210 km the guys left me. 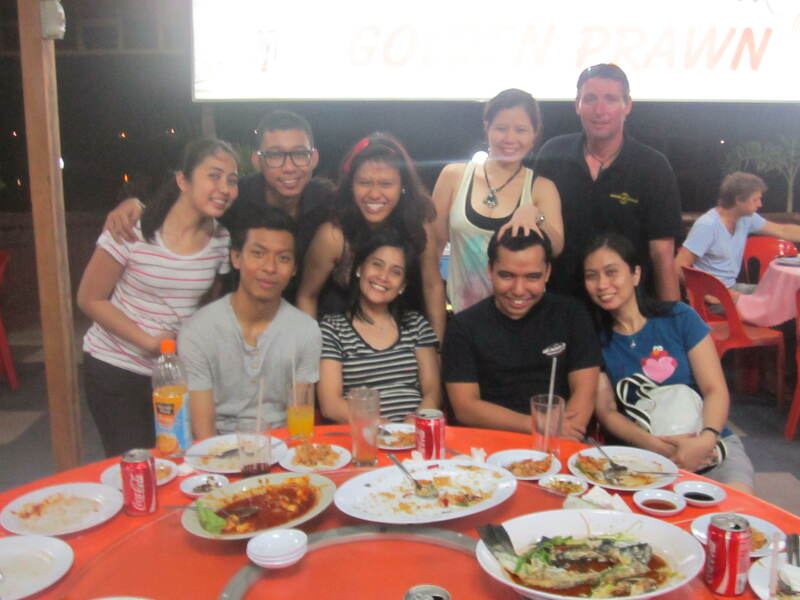 The night before Adrian had sent out his driver from Balikpapan to pick him and El up. So after lunch it was a bit sad to say goodbye. It will only be a few days before I see them again in Balikpapan. After lunch the road got worse. It was hot and it even rained for a short bit. At 4 p.m. I stopped for some dinner. I had a little sleep after dinner and just wasn’t keen to move on knowing some big hills were about to start. I asked the restaurant if there was anywhere to sleep and they weren’t keen. I went only about 50 meters and next to a garage was a little bit of land I asked the guy at the garage if I could camp and he nodded. When I got up this morning I knew exactly what I had waiting……………some very big hills and some bad roads – El and Adrian had texted me with some info on what lay ahead. No procrastinating I was up and gone. It turned out to be a very tough day. It was hot and there were more ups than downs and they were so steep I had to push my bike up some of it. The road was bad – full of pot-holes. By 4 p.m. I had only done 70 km and was still 165 km from Balikpapan. I was feeling exhausted but had to push on straight into another huge hill. I pushed the bike up a lot of that too. At one point I had to park up on the side and lay down because I was overheating and feeling sick. I had some more scooters stop and see if I was alright. They asked me if I wanted a tow to the top. I had a rest and the heart beat slowed down and I cooled down a bit. I finally got to the top around 5:30 p.m. Some nice views. Didn’t have long to admire because I wanted to get down the other side and to Kuaro which was a reasonable size town. After a tough day I fancied a hotel. I had another scooter pull up. The guy was keen to talk. It was gettig dark and I was still a few km from Kuaro. Since I had no lights on the bike I got the guy to stay with me. He even helped me find a hotel. The outside was nice and I paid my money $20. But when I saw the room I was disappointed. It was dirty and musty. No toilet seat. No shower. No towel or soap. Just the pot and tub of water. Not even Wifi. I got my money back and left. For $20 I have had a lot better. It was dark so I just started to push my bike out of town. I asked at a restaurant for somewhere to sleep…………They weren’t keen so I moved on. 200 meters down the road I saw a nice porch which I thought would be nice to camp on. The building was down a short drive and back from the road. A door was open and I cycled up and asked a lady if I could sleep on the porch. Then her husband turned up and he gave the okay which was some welcome news. He showed me the shower and toilet and while I was putting up the tent he brought me out a jug of cold water and a cup of coffee. I cleaned myself up and then headed down the road to find something to eat. Next minute the guy turned up and gestured that dinner was waiting for me back at his house. I went back to find he had been out and brought me some chicken satay. 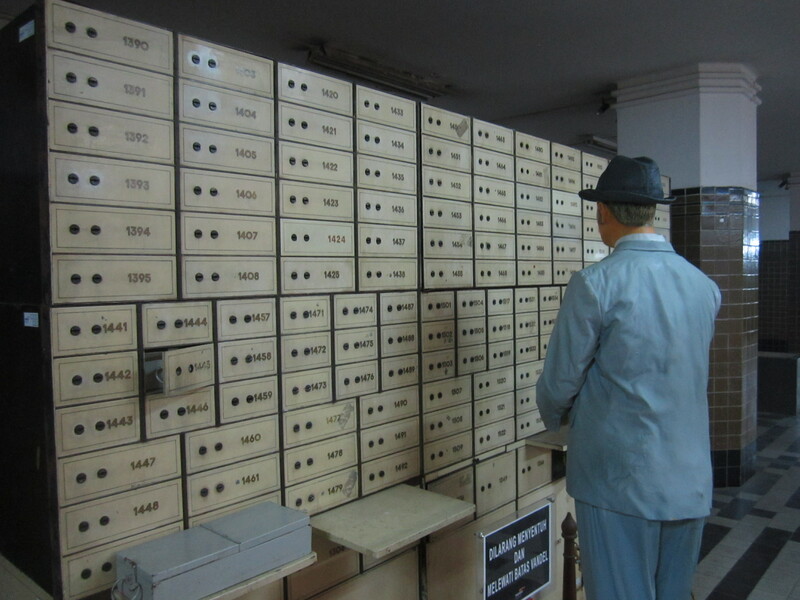 At first I wasn’t sure what the building was then I realized it was a post office and the guy was the postmaster. I wasn’t sleeping for long when it started to rain heavily. I was undercover………….I didn’t have the fly on. But was getting a little wet. I didn’t mind because it was so hot anyway. 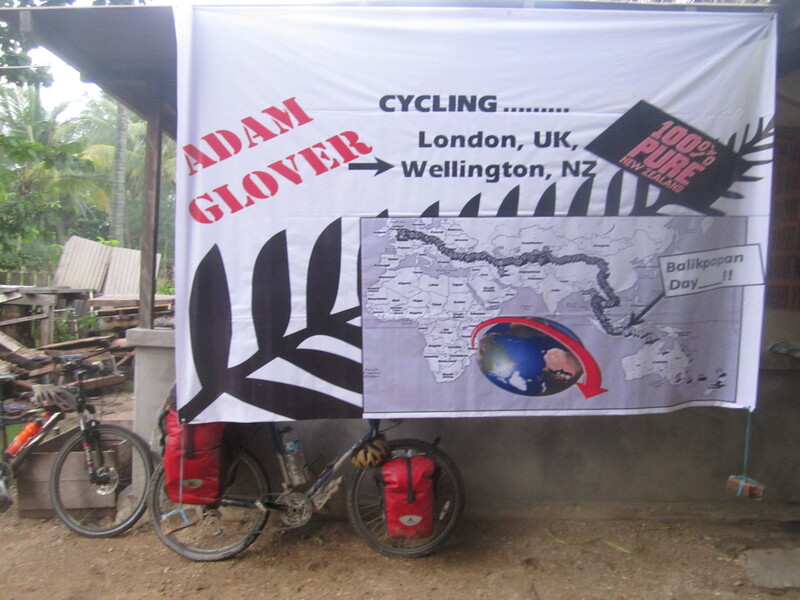 The postmaster had already given me a tarp to cover the bike. He came out and covered my tent with mail bags while I was sleeping. The plan was to stop for beer and pizza on the way. We cycled into the car park of the beach bar. I parked my bike behind a hanging banner. It then wasn’t till I had a closer look that the Google map on it looked very familiar………………….then looking even closer and I saw my name and I realized it was for me. It was such a surprise and such a nice thing for El and Otto to have organized. I met a few more expats in the bar. They are all in the mining industry. I had Pizza for the first time in nearly a year and it was great. One beer was enough for me………..I tried two……….but had to swap it for water. I was just too dehydrated. We weren’t at the beach bar too late and only a short 1 km ride back to El and Otto’s place which is one of 10 big units in a closed-off estate. Joy reading your blogs every day.we sort of met in vietnam,meantime ,im back in belgium working like an idiot:-) ,the energy of our holiday is long gone but your stories keep inspiring me.keep up the spirit for you keep inspiring me! Hi Adam, you have three mislabled days.. days 361, 362, and 363. What an amazing story BTW!